September is here and after the long, hot summer I am ready for Autumn. While walking around the garden this morning I noticed some ripe blackberries on my thornless plant. ALao for clarity I should mention that I did not have my glasses on. Expecting a great harvest I hurried back to the kitchen to collect a modest size bowl. Also I grabbed my glasses. Five ripe blackberries. Five! Consoling myself I plundered our freezer, where fortunately I had a stash. 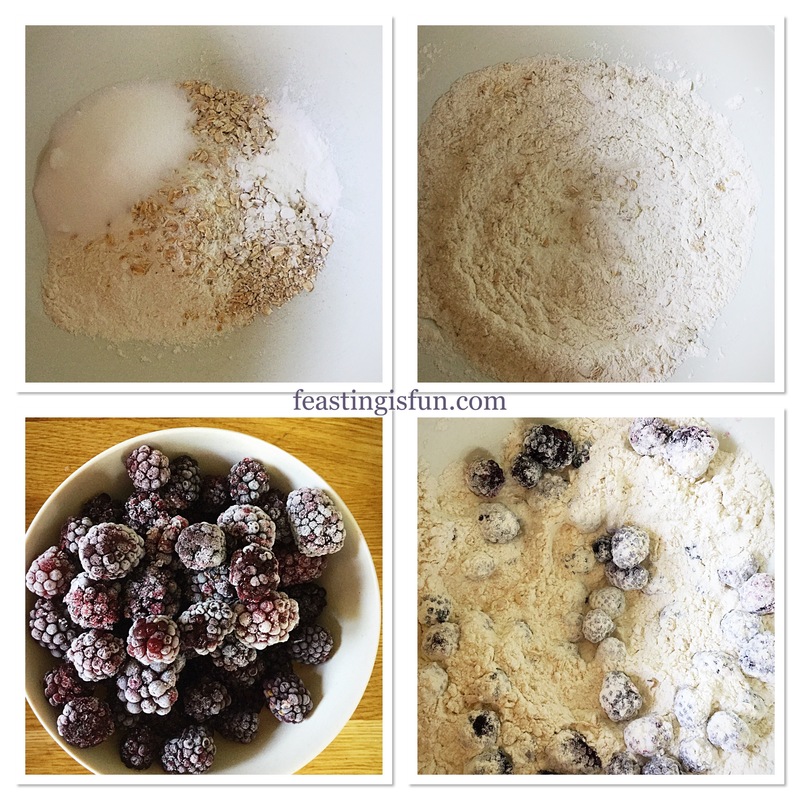 Finally I can now share my Easy Blackberry Oat Muffin Recipe. While I find it very satisfying to use produce picked from our garden I am also a realist. Because of the very hot and dry summer some of our fruiting plants have suffered. While our cherry tree had a bumper crop this year, we haven’t any plums and as I mentioned the blackberries are small and scant. Although I am hopeful for a reasonable apple harvest. Even if they are a little smaller this year, I’m sure they will be sweet. I am glad that I had the foresight to buy punnets of British blackberries and freeze them. Especially as most berries freeze well, with the exception of strawberries. While strawberries defrost to a mushy mess, frozen blackberries, raspberries, red and blackcurrants can be used in place of fresh fruit when it is out of season. Whether you buy and freeze the fruit yourself or buy it ready frozen, it means that we need not be denied luscious berries in the depths of winter. First of all into a large bowl add the flour, oats, sugar, baking powder and salt. Usng a balloon whisk mix all of the dry ingredients together – dry mix. Hold back 12 blackberries for topping the muffins and tip the remaining blackberries into the dry mix. Gently cover with the flour mixture to coat. The dry part of the muffin mix. Into a separate jug measure out the milk. 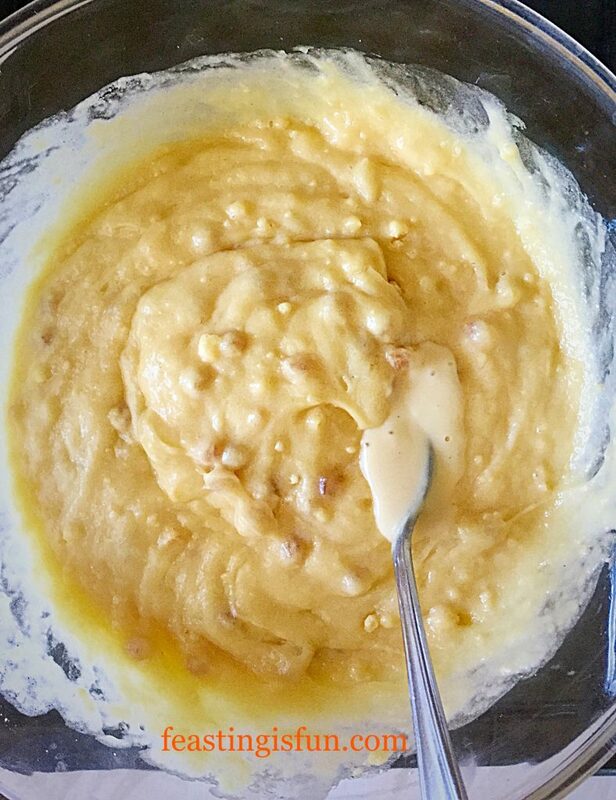 Add the eggs, melted butter and vanilla extract and beat with a fork to combine – wet mix. Make a well in the centre of the dry mix and pour the wet mix in. Stir the mixture (approximately 10 times) with a spoon to almost combine, taking care not to break up the berries. A few flour streaks are acceptable. Over mixing will almost certainly result in tough muffins. Line a muffin tin with paper liners. Alternatively tulip style muffin wrappers used in my Spiced Pumpkin Walnut Muffins also can be used. Use an ice cream scoop to divide the muffin mixture evenly between the 12 cases. Combining the wet and dry to make the batter. 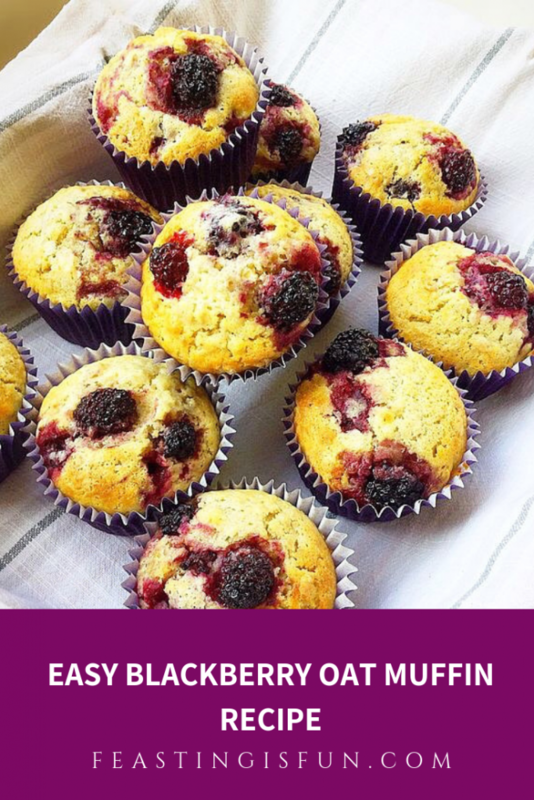 Place a blackberry (from those held back) on top of each muffin. Finally, using a teaspoon, tap a light dusting of caster sugar on top of each muffin. 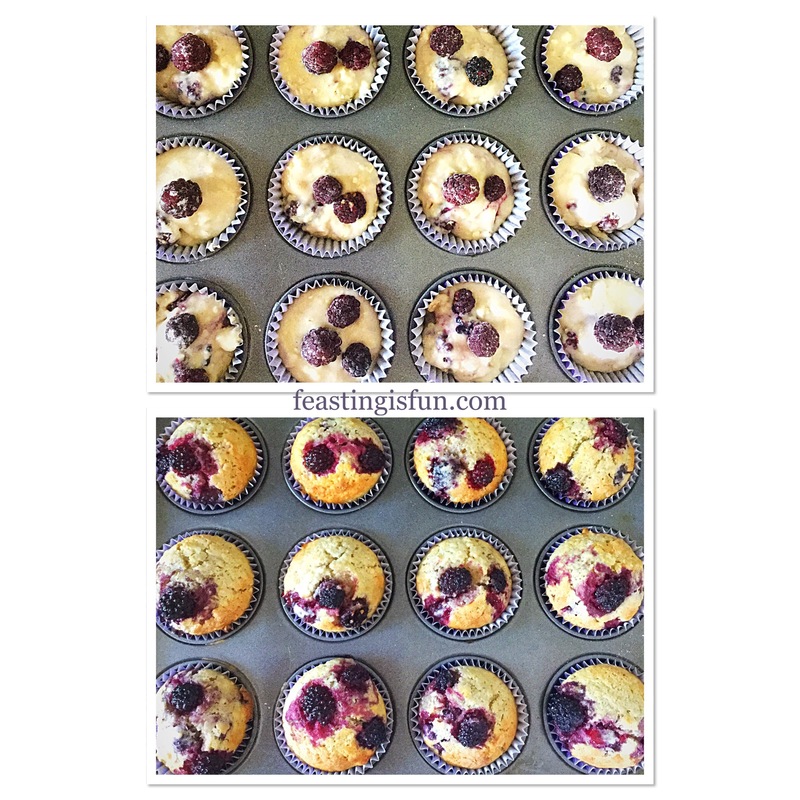 Place the muffin tin into the centre of a preheated oven and bake for 25-30 minutes. Topping the muffins before baking. The muffins are baked when risen, golden and firm to touch. 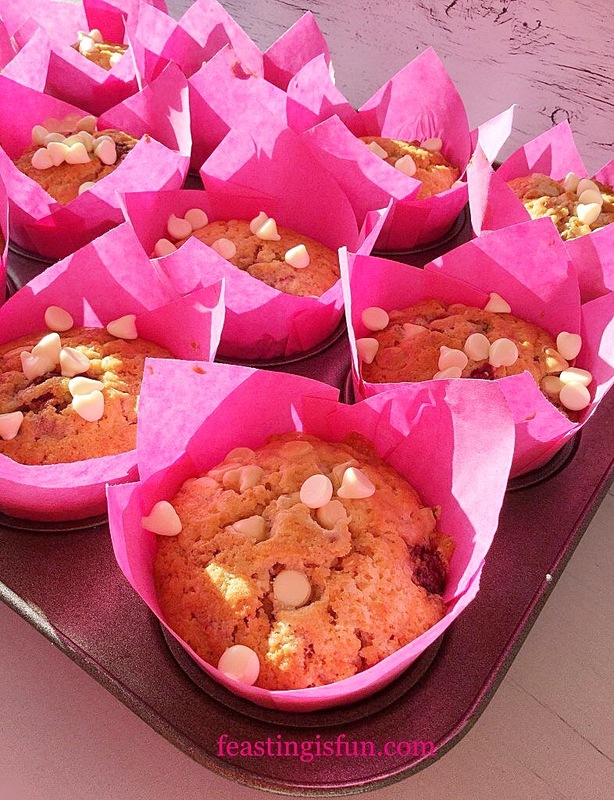 Immediately remove the muffins from the tin and place on to a cooling rack – take care as the muffins will be hot. Allow the muffins to cool slightly before serving. 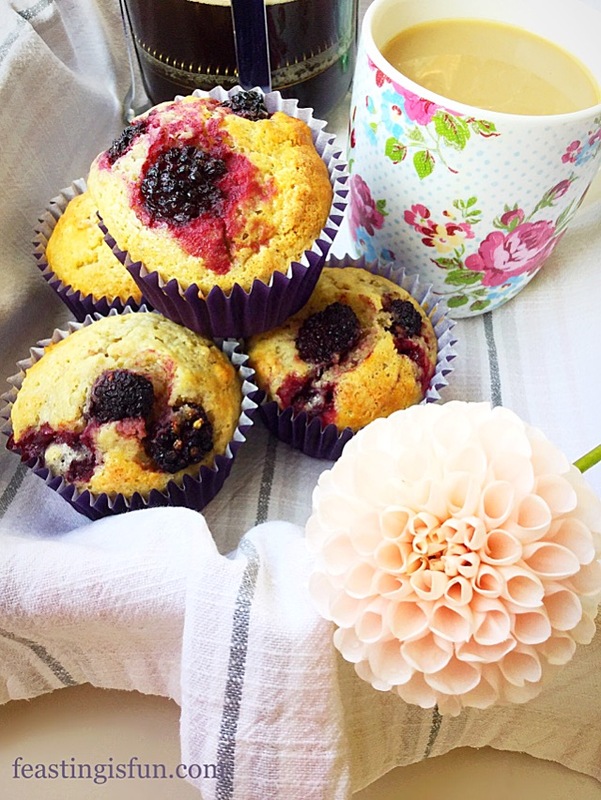 Freshly baked muffins are at their best on the day they are made. Although you can store them in an airtight container for up to two days, refrigerate in warm weather and then refresh in a medium oven for 5 minutes. Especially delicious eats to start the day and also plug that hunger gap throughout the day. Since these muffins truly are delicious served warm from the oven, why not bake them with the intention to share. Neighbours, friends and family are sure to be delighted with a surprise delivery of freshly made muffins. And it is a fact that food always tastes better when shared! Whatever you are making, baking and creating in your kitchens have fun preparing and sharing your feast. 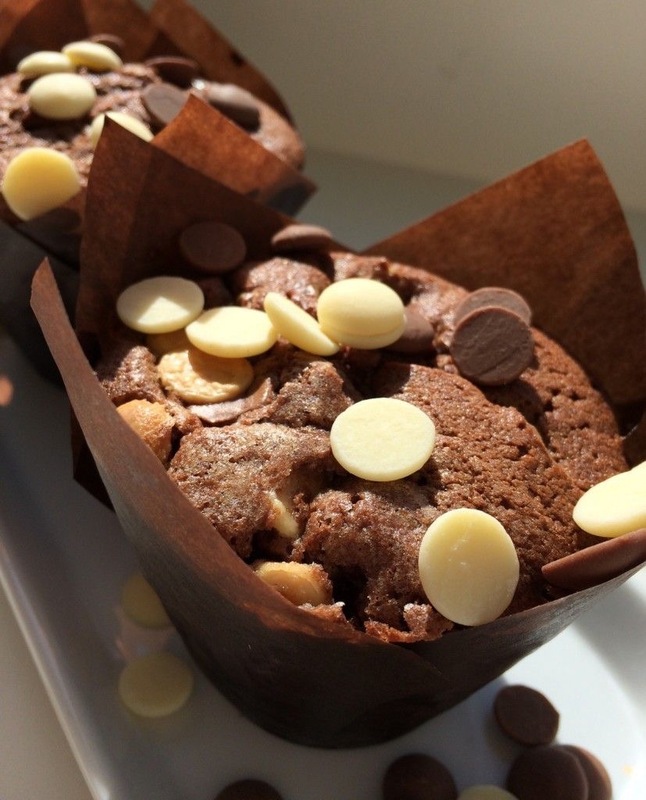 Coffee shop style muffins, it would seem, are here to stay. Big, light, tulip wrapped delights, packed full of chocolate or fruit. Why fight a trend that is clearly doing so well? Since we enjoy this style of muffin too, I have embraced everything about them and come up with my own recipes. 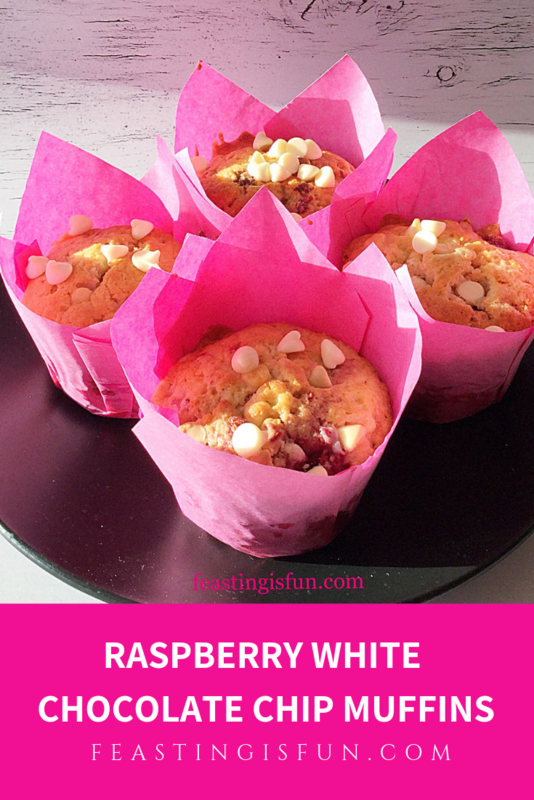 So these Raspberry White Chocolate Chip Muffins are utterly delicious. 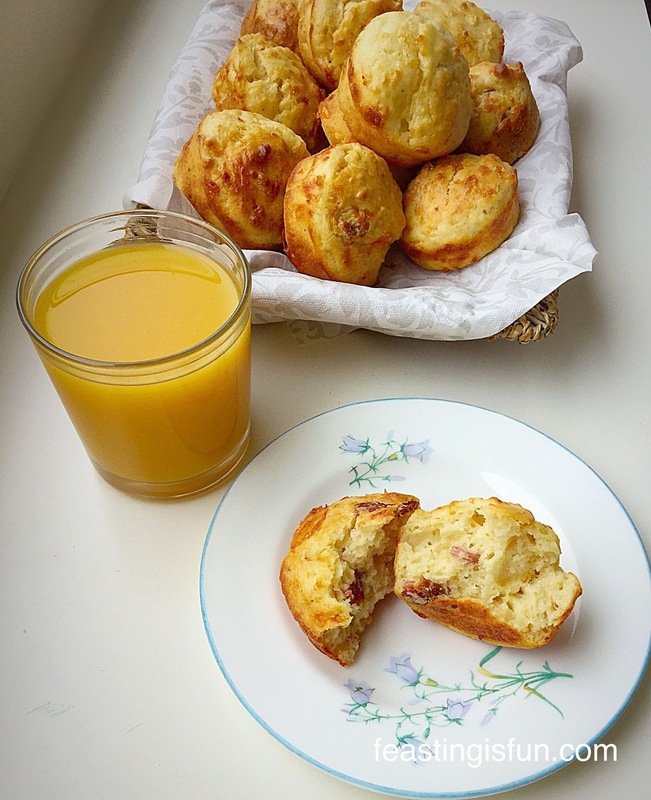 While the texture has more in common with a cake, than a true muffin such as Cheese Bacon Breakfast Muffins , there is room for both in our home. Because not everyone is keen on whipped buttercream that tops most cupcakes, these light, raspberry filled treats are a great alternative. 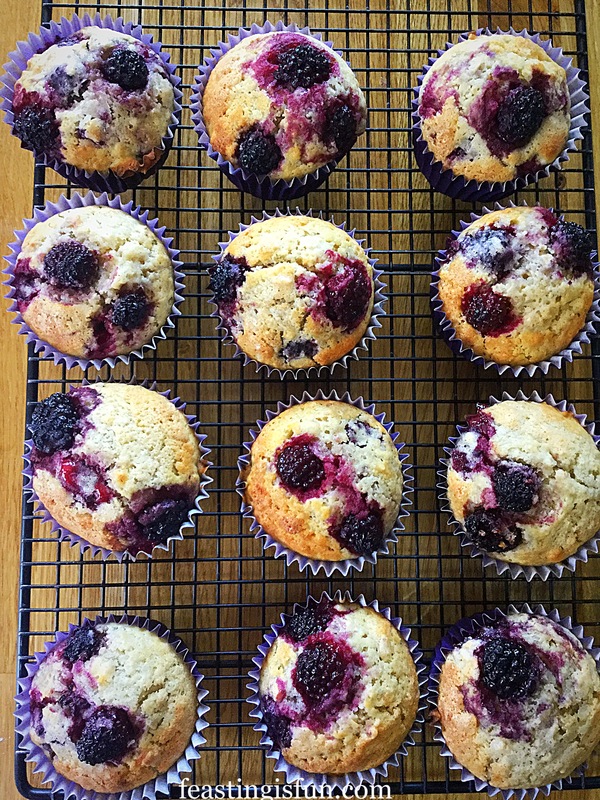 As well as being not-too-sweet, the raspberries on baking become jammy pods within the muffin. White chocolate chips within and on top of the muffin, provide small, sweet burst of vanilla chocolate flavour. While balancing the slightly tart flavour given by the raspberries. 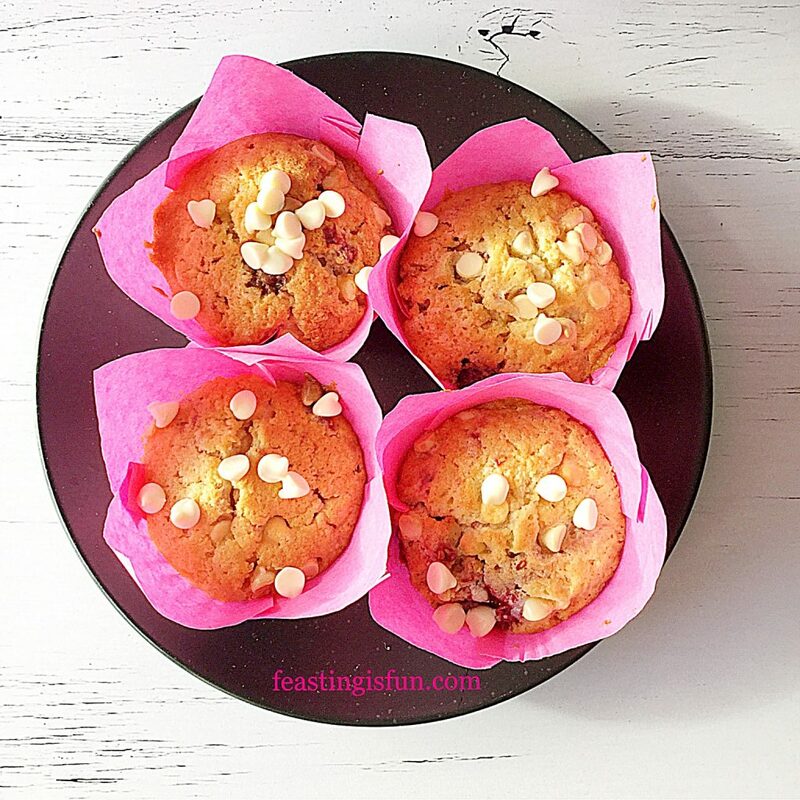 Together they create a delightful flavour pairing within the lightest of muffins. 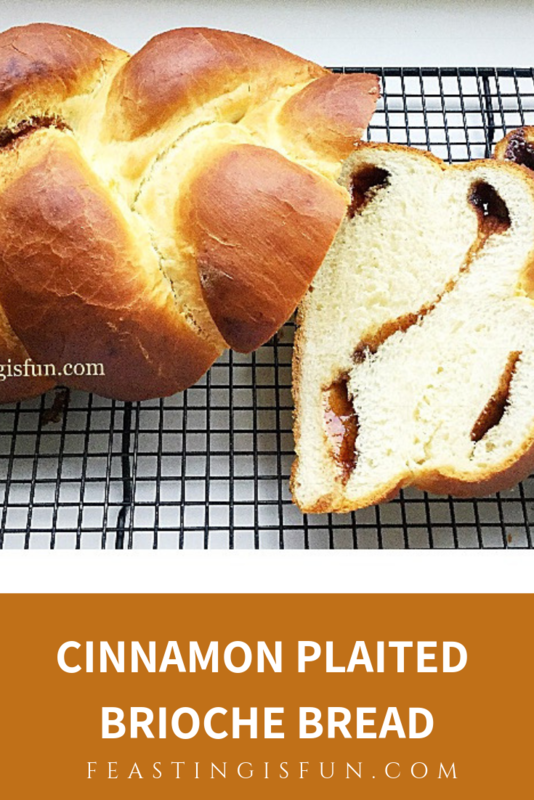 Perfect for grabbing and eating for breakfast or brunch when rushed in the morning. Likewise they also travel well in packed lunches and as part of a picnic. 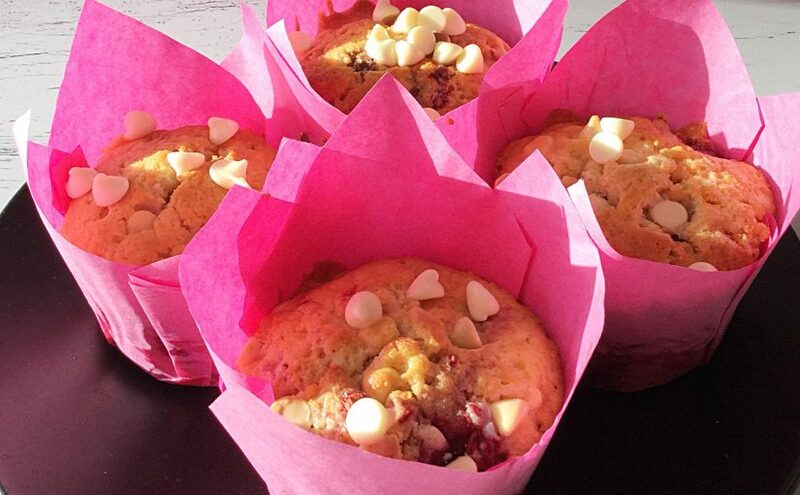 Baking the Raspberry White Chocolate Chip Muffins in tulip wrappers allows for a generously sized muffin. Also it adds to the coffee shop style of these muffins. 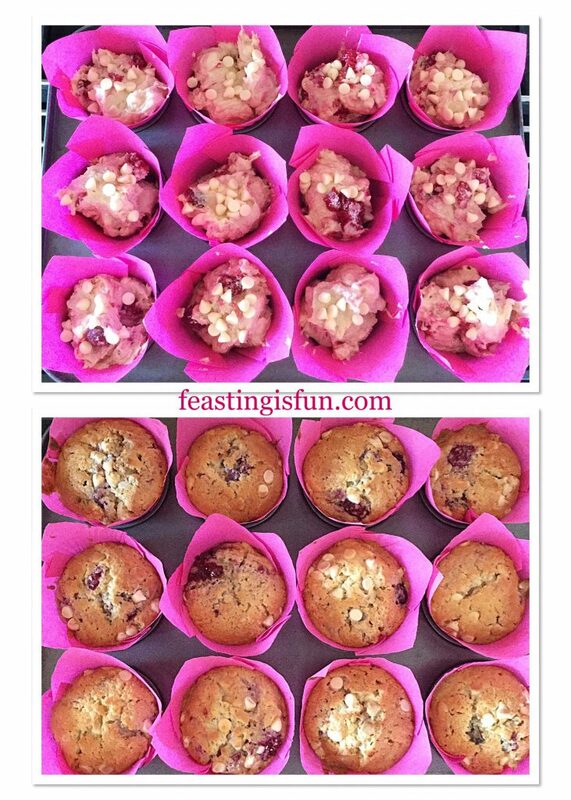 If not using tulip wrappers to bake with, use the deepest muffin cases and fill two thirds full. As a result the baked muffins may bake over the muffin cases. If this happens, simply run a blunt butter knife between the muffin and tin to release. 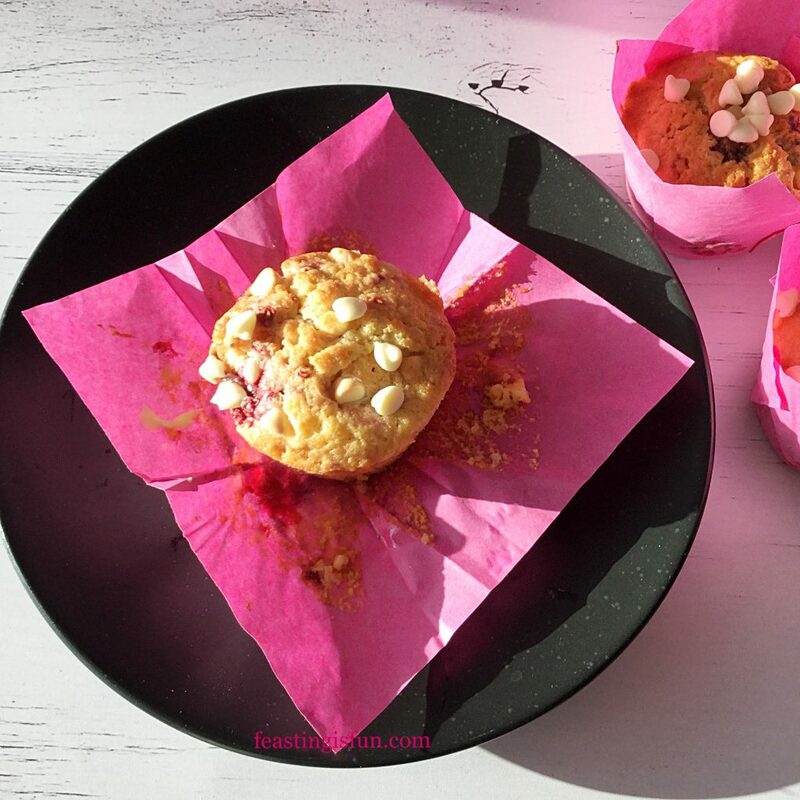 Tulip wrappers pull away easily revealing the baked muffin. First of all line a 12 hole muffin tin with tulip wrappers or muffin cases. Into a large bowl add the butter, sugar, salt and whisk until well combined. Then add the eggs, vanilla extract and yoghurt. On top of these wet ingredients sift in the flour and baking powder. 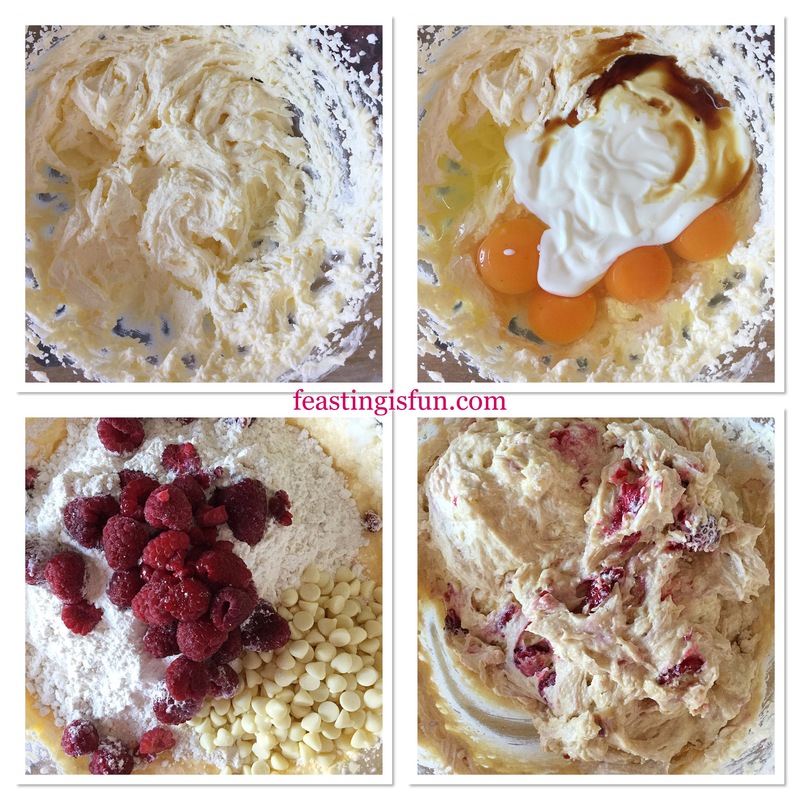 Finally add the raspberries and 100g/4oz of the white chocolate chips. Using a large spoon gently fold all of the ingredients together until just combined. Take care not to break up the raspberries. Spoon the batter into the wrappers, dividing equally between them. Finish by sprinkling over the remaining white chocolate chips on to the surface of the un-baked muffins. 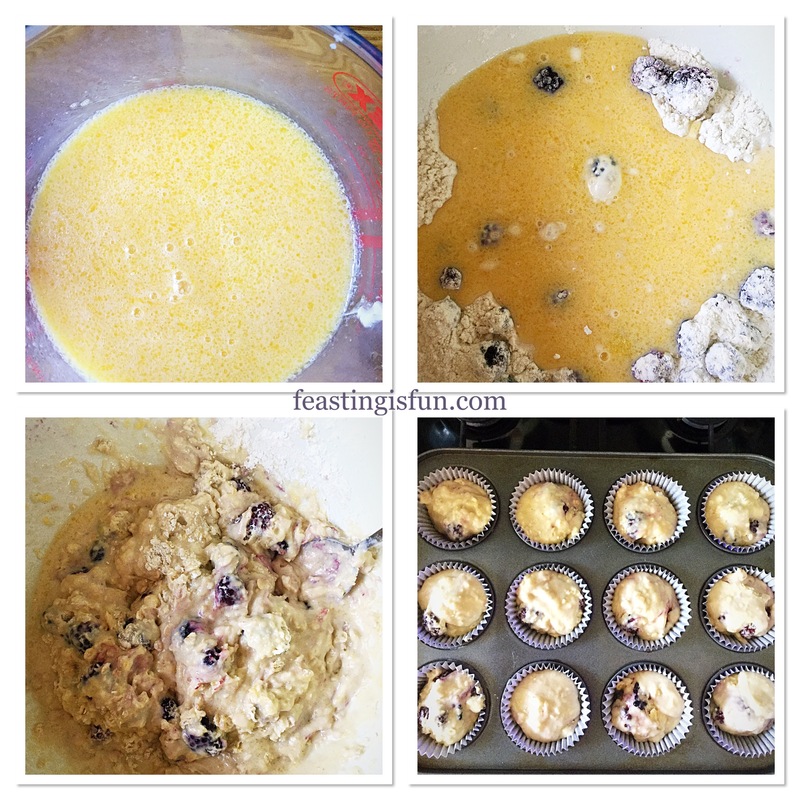 Place the muffins into the centre of a preheated oven and bake for 25-35 minutes. The muffins are baked when they are golden, just firm to touch and an inserted cocktail stick comes out clean, without any batter attached. 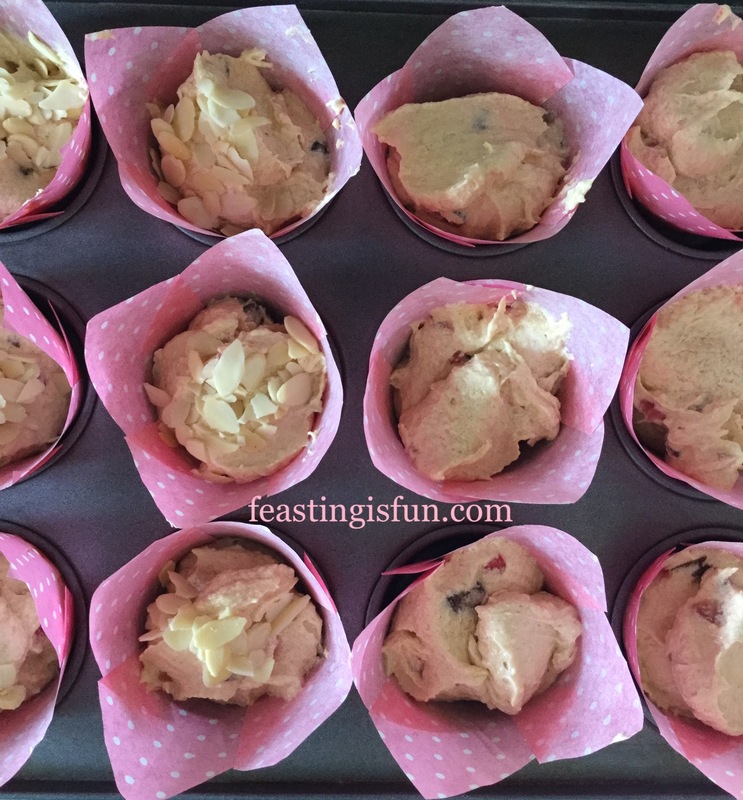 As soon as the muffins are baked remove from the oven and allow to cool in the tin if using tulip wrappers. Otherwise, if using muffin cases, cool for 10 minutes in the tin then remove and place on a cooling rack to finish cooling. I like to serve these muffins warm. While the chocolate chips are still slightly melted. Although they are fine to serve cold as well. 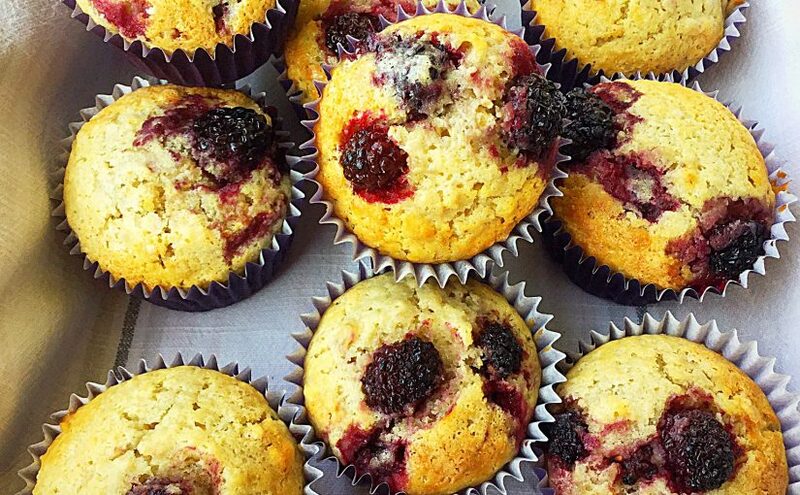 These muffins are best eaten within 24 hours of being made. Yet they can be stored, once cooled, in an airtight container for up to 3 days. Keep refrigerated during warm weather. 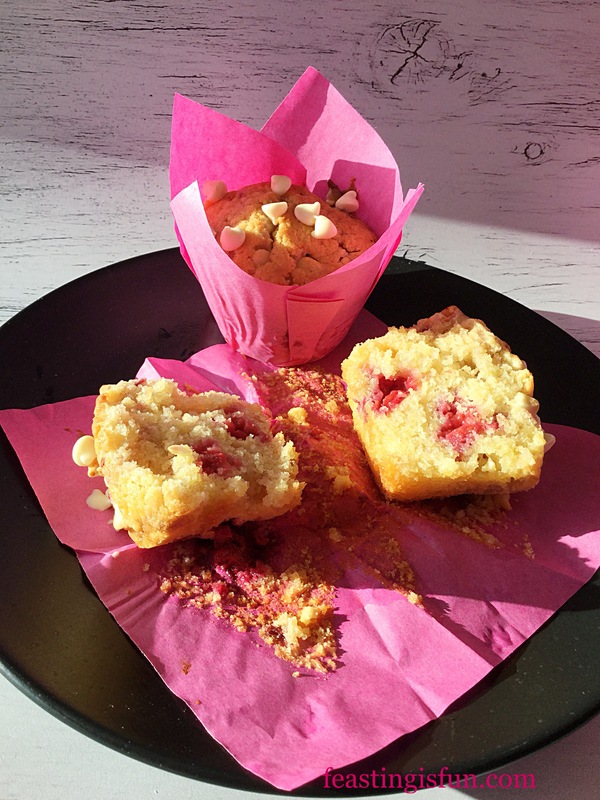 The whole raspberries distribute evenly throughout the muffin. 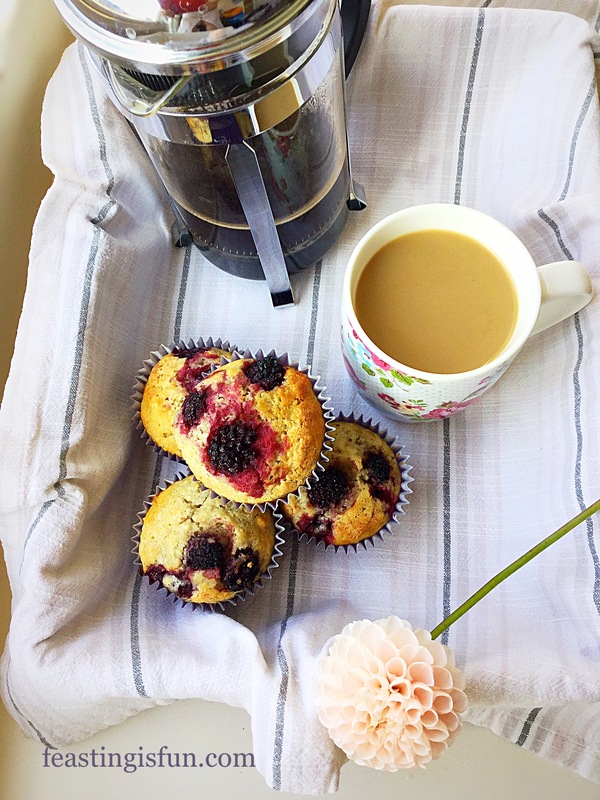 Since actually making these muffins took mere moments, why not try them yourself? Making use of frozen raspberries allowed the fruit to keep its shape more easily. Yet, if fresh raspberries are in abundance or growing in the garden absolutely use those. 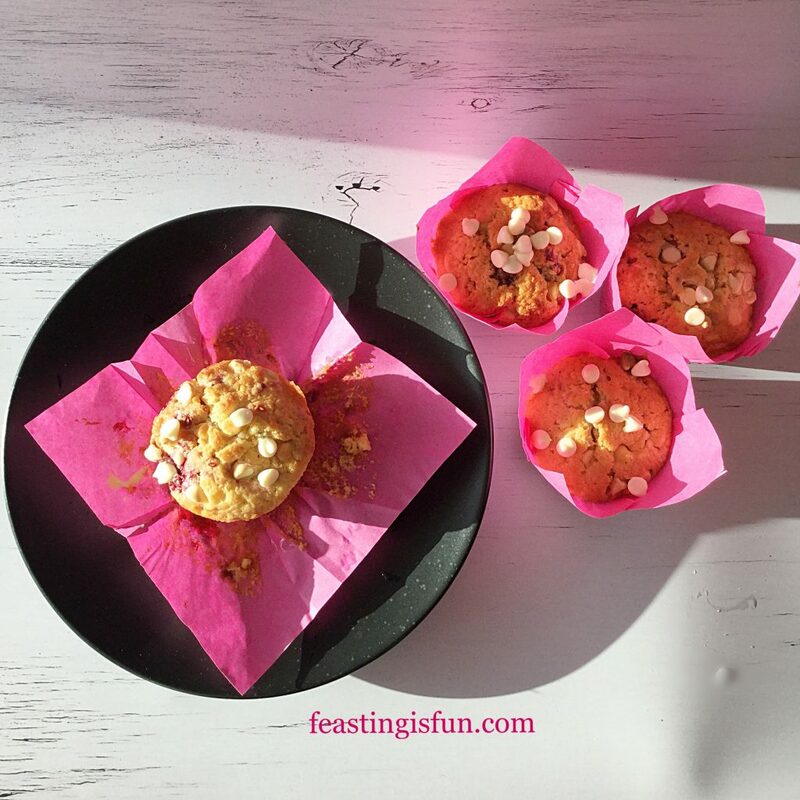 Deep blush streaked muffins, warm from the oven taste good any day of the year! Christmas will soon be upon us and among the festive food chocolate plays a prominent role. Whether in advent calendars, selection packs, gold coins or the many foil wrapped, boxed and displayed chocolate treats, it is central to celebration feasting. 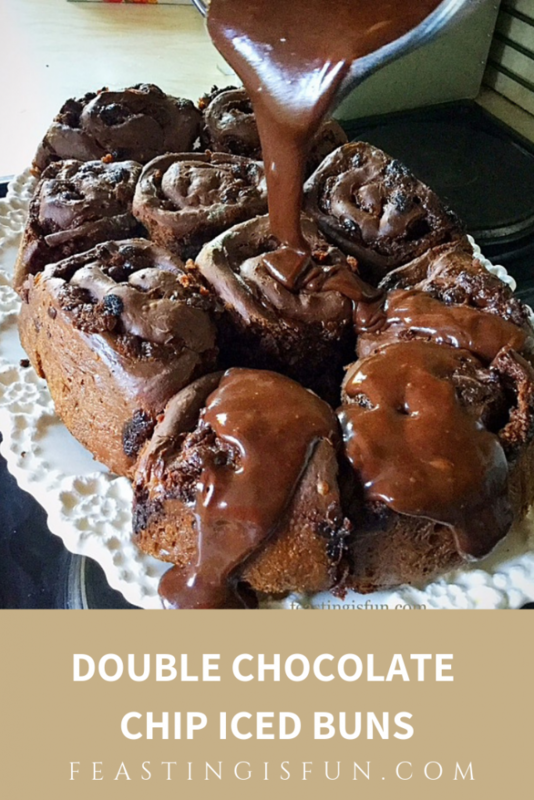 Therefore these Double Chocolate Chip Iced Buns are the perfect treat to share and enjoy over the holiday season, or any special occasion. Since, if you’re going to make a chocolate bun it really should be THE BEST tasting chocolate bun ever. 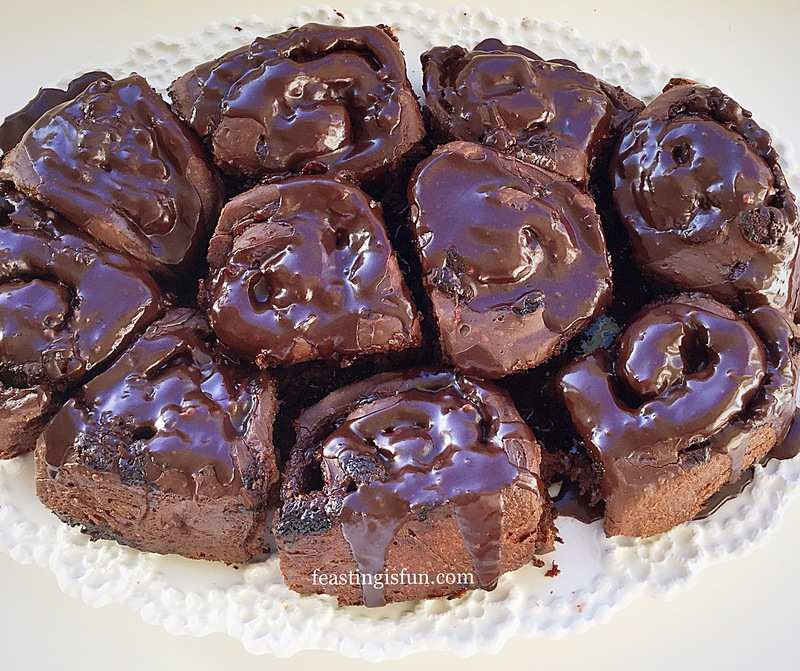 While light and fluffy these buns are packed with chocolate chips and finished with a thick chocolate icing. 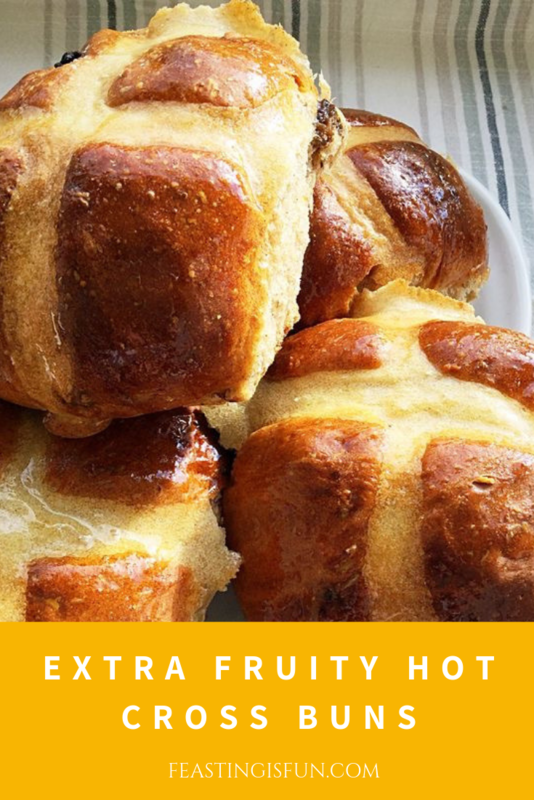 Also these buns tick every box , not too sweet, not too rich, simply the perfect balance of flavour and texture baked into the very best tasting breakfast bun. Alternatively eaten with coffee as an afternoon treat, these buns need no excuse to be eaten! 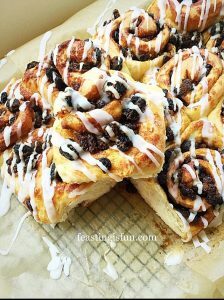 While these incredible tasting, chocolate packed buns were made with Christmas in mind, there really is no reason at all to stop you baking them at other times. 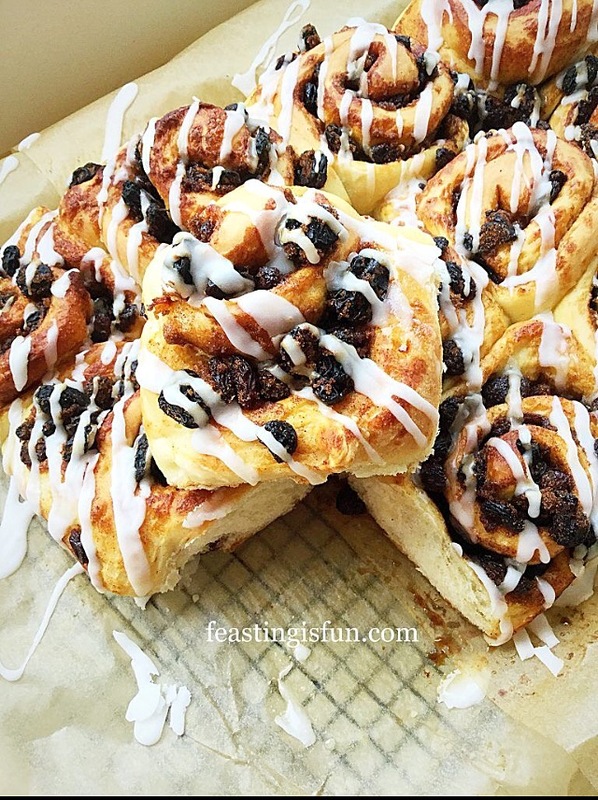 Any chocolate lover would appreciate a birthday breakfast of Double Chocolate Chip Iced Buns. Especially if you have friends staying, sleepovers, special occasions, all the perfect excuse to bake. Finally, they are made and left to prove overnight, so all that’s left to do is bake and glaze in the morning. Easy. 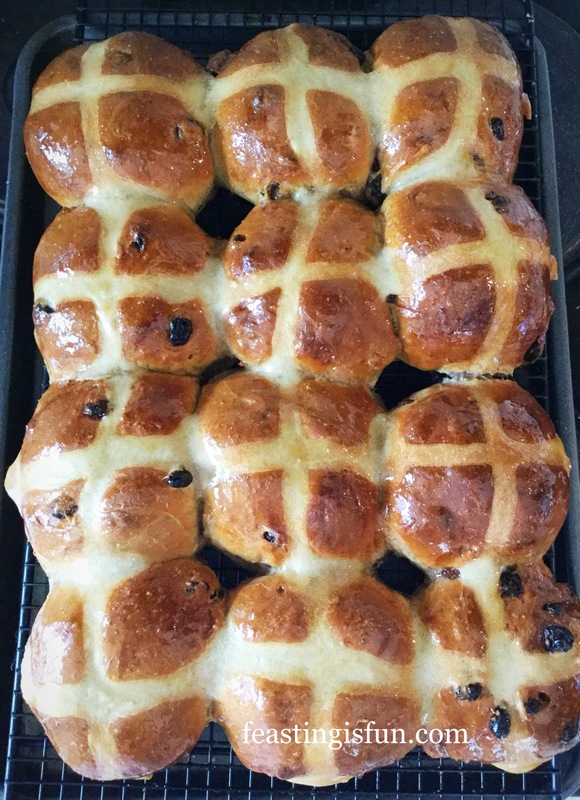 As soon as my chief taste testers, here at Feasting headquarters had tasted these buns, success was proclaimed. Even from the harshest of my critics. Yummy, mmm are there more, escaped from messy chocolate mouths. As for me, the harshest judge of all, well, I am impressed. All of the attempts at making the perfect chocolate swirl bread have paid off. 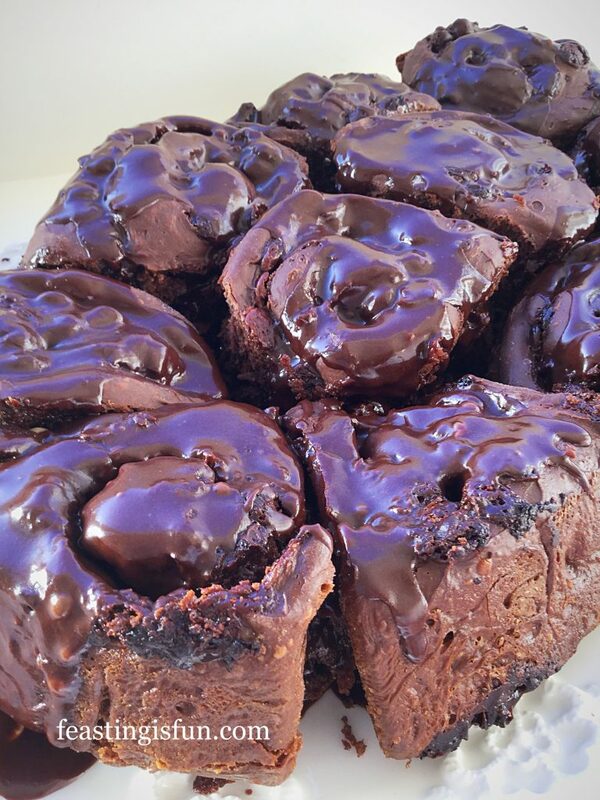 Flavour and texture in perfect chocolate swirled harmony. 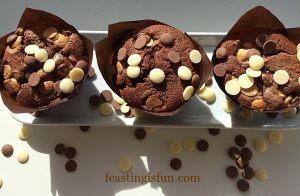 250g Milk Chocolate Chips or chopped chocolate – do not use stabilised chocolate chips, as you would for chocolate chip cookies, the chocolate should melt when baked. Note: I strongly recommend using a stand mixer with dough hook attachment for mixing the dough. 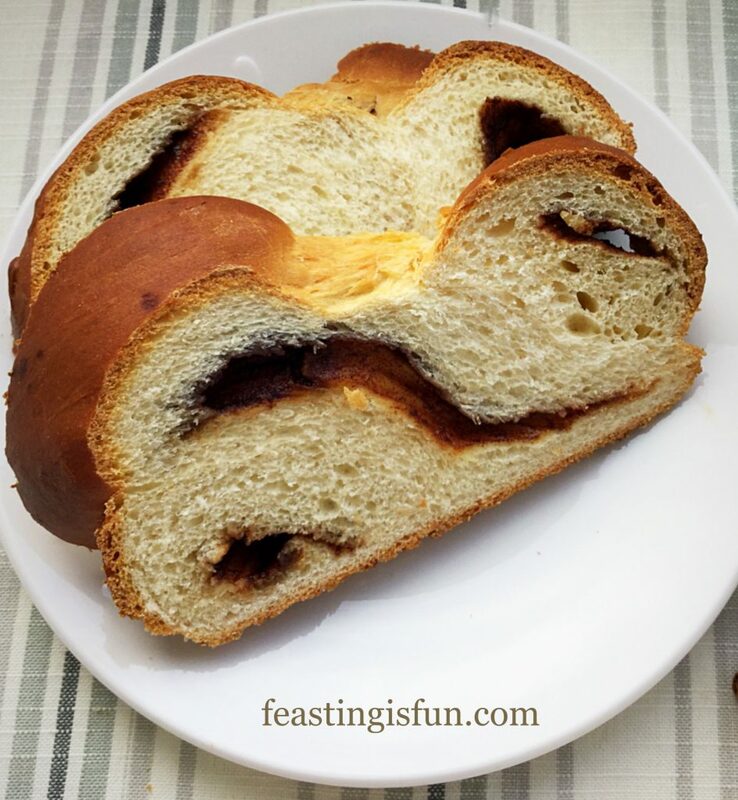 The chocolate dough has a high butter content and is extremely sticky. 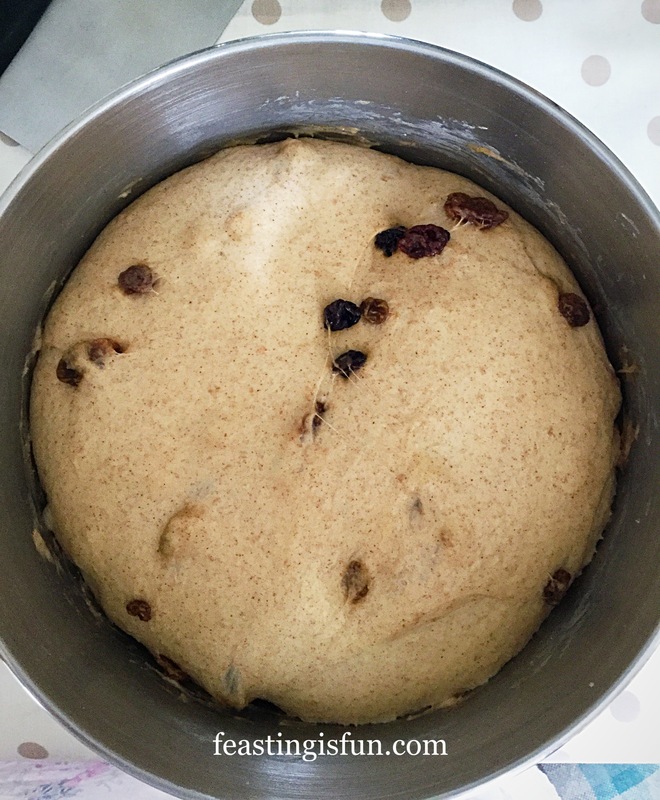 Using a stand mixer ensures thorough mixing of the dough. Measure the milk into a microwaveable jug and then add the butter broken into small pieces. Zap in the microwave until the milk is slightly warmed. It should feel the same as body temperature. Also the butter will soften and start to melt. Pour the warmed milk/butter into the bowl of the stand mixer. Add the yeast, sugar, vanilla extract and both eggs to the bowl. Next add the flour, cocoa powder and salt. With the dough hook attached mix slowly until the ingredients are combined into a dough. Continue mixing on medium speed for a further 20 minutes. Stop the mixer, lift the dough hook and scrape any dough back into the bowl. Cover the bowl with cling film and leave in a draft free place until doubled in size. This first prove may take up to 2 hours. As soon as the dough is ready, turn out on to a lightly floured worktop. A plastic scraper will help release all of the dough from the bowl. 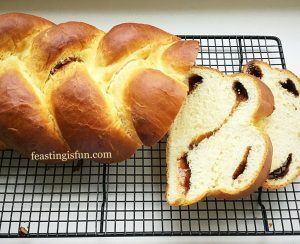 Using the technique shown in Easy Homemade Cottage Loaf, pull out the dough and press into the centre. Continue around the edge until the dough is neat and smooth. Roll the dough out until it is 30.5cm D x 35.5cm W (12” x 14”) rectangle. Sprinkle the chocolate chips/chopped chocolate evenly over the dough. Making the dough and preparing the chocolate buns. 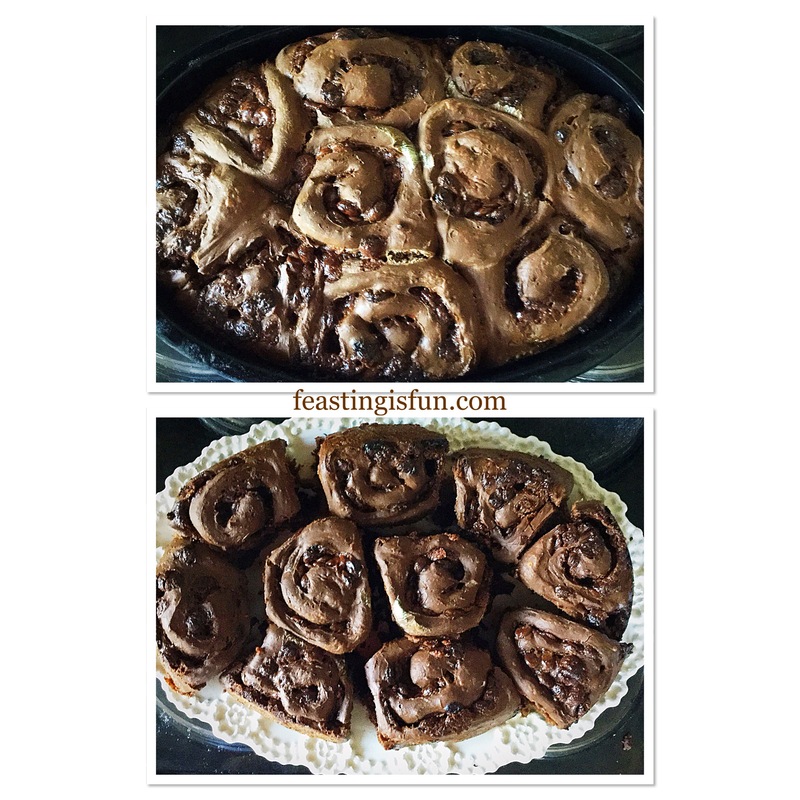 Rolling from the wide side of the dough, take the front edge, starting at one side, roll and tuck the chocolate and dough. 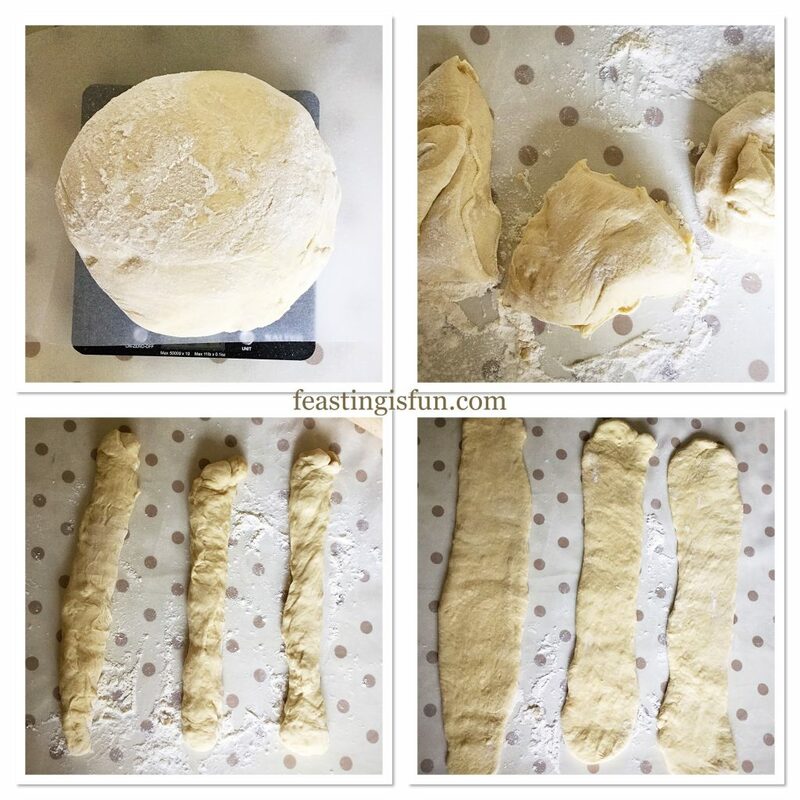 Continue across the front edge of the dough until you have formed the beginning of a roll. 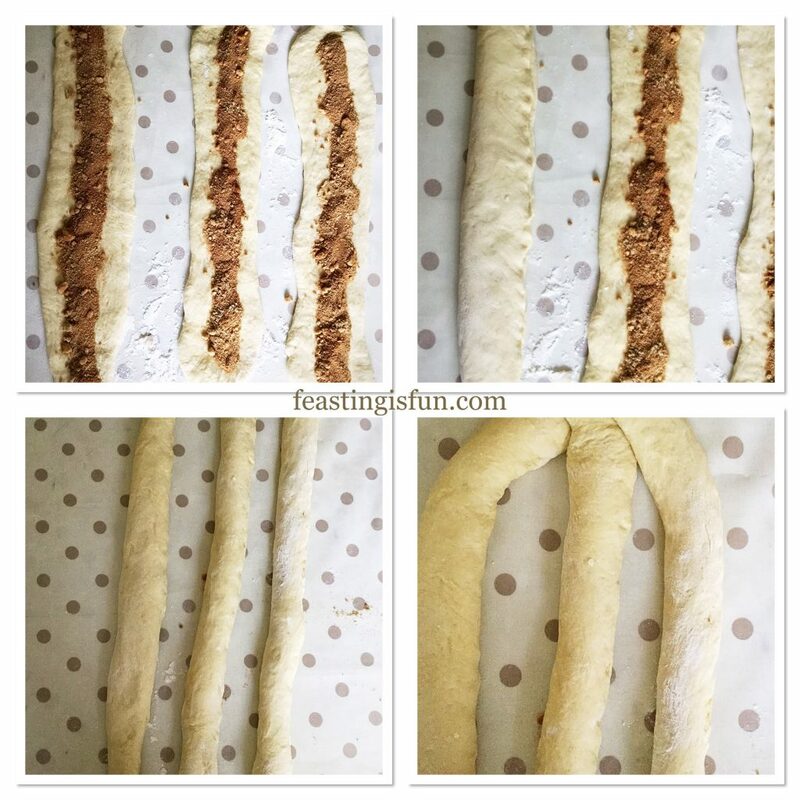 Evenly roll the entire dough, tucking and ensuring it is even. Finish with the seam underneath the finished roll. Using a sharp knife cut off the uneven sides. Divide the roll in half and then cut 5 even potions from each half. Saw through the dough, using the blade to cut through. 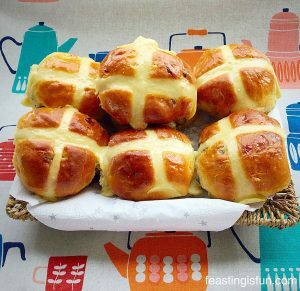 Place the buns into a large, well buttered baking tin with deep sides. Alternatively butter 2 deep 8 inch cake tins and place 5 chocolate buns into each. 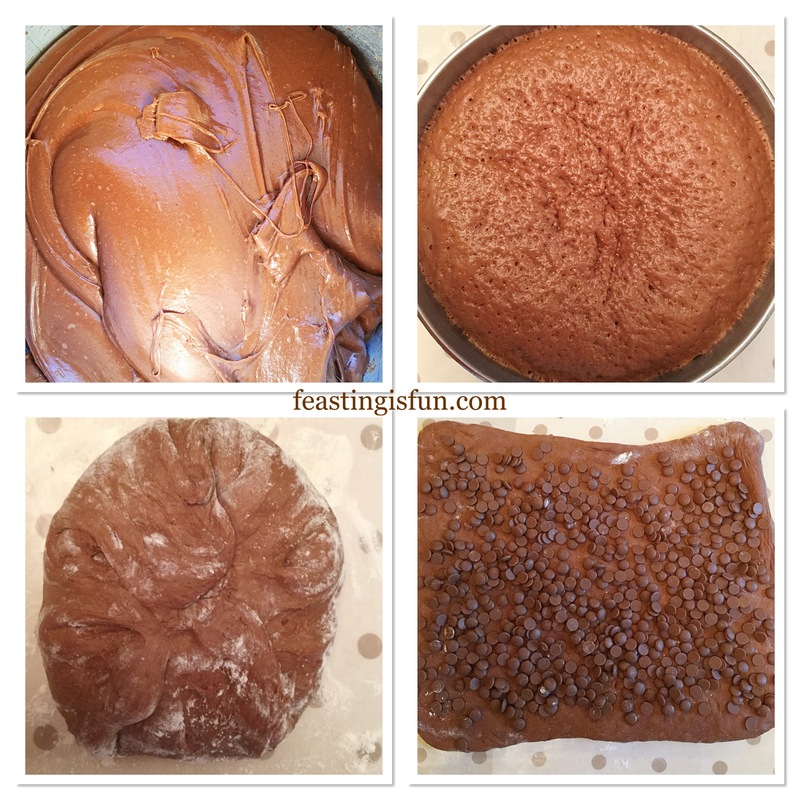 Cover with cling film and refrigerate overnight. The dough will prove very slowly in the cold fridge. 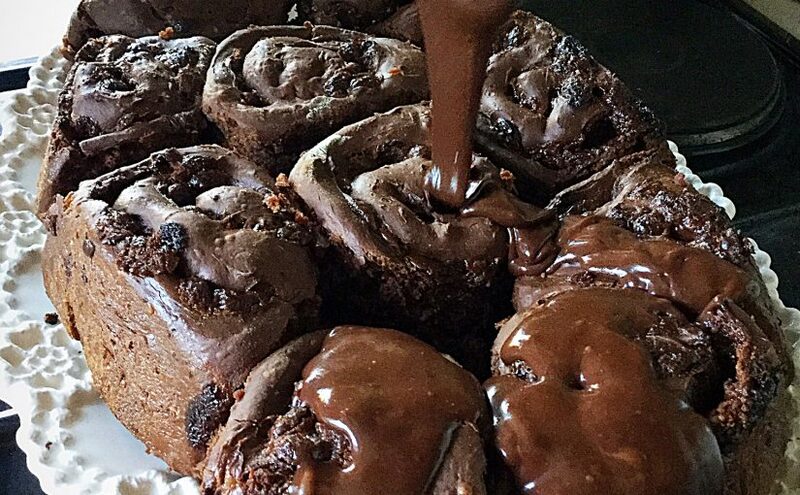 Creating the perfect chocolate swirl. The next morning remove the chocolate buns from the fridge and allow to come up to room temperature, approximately 30 minutes. 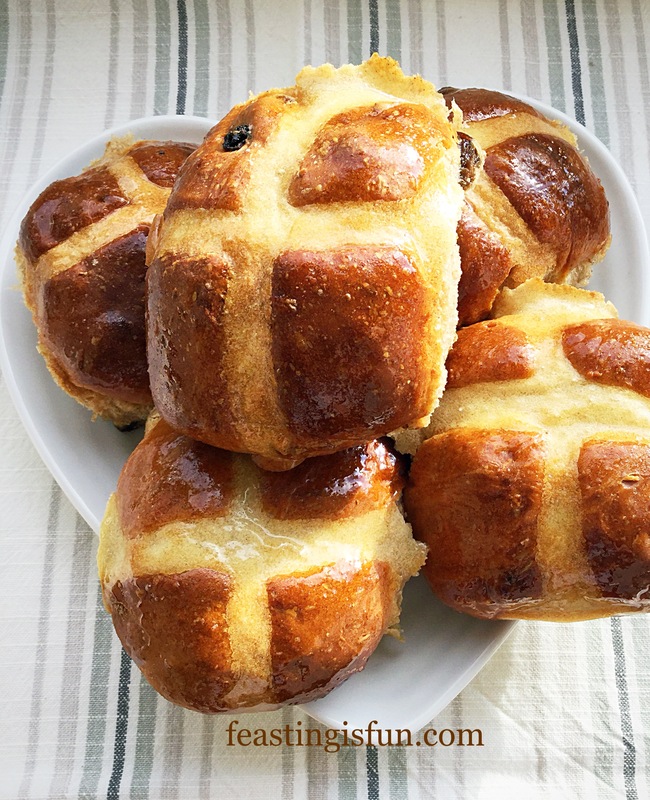 While the buns are warming preheat the oven 200C/180C fan, 400F, gas mark 6. 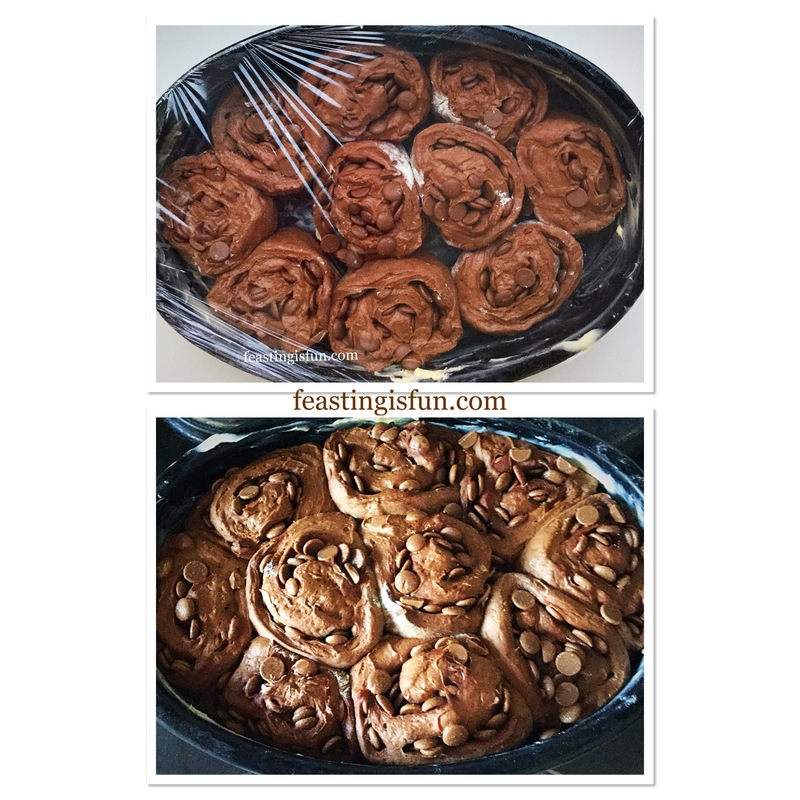 Double Chocolate Chip Iced Buns before and after an overnight prove. As soon as the buns have warmed place in to the centre of the oven and bake for 30-35 minutes. 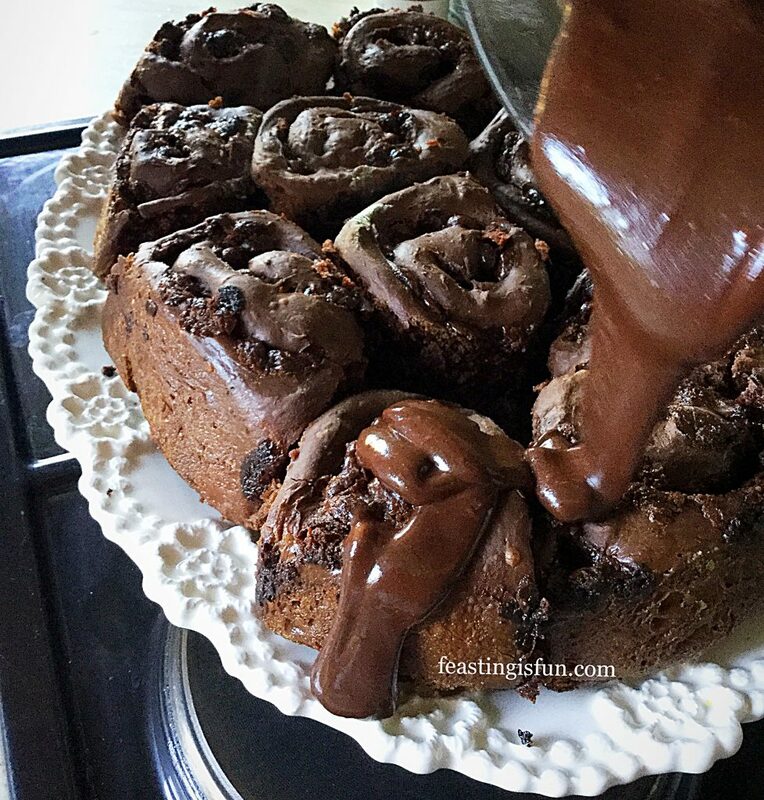 While the buns are baking make the chocolate icing glaze. Weigh the icing sugar and cocoa into a large jug. Add approximately 6 tablespoons of hot water and stir to mix. The icing should be thick yet still able to pour. If needed add extra hot water one tablespoon at a time. Note – the icing will thicken on cooling. Check the buns after 30 minutes. They are baked when the top of the buns are firm and sounds hollow when tapped. Run a palette knife around the outside edge of the buns, carefully lifting the edge of the buns as you do so. Place a large board, (I use a chopping board) over the top of the baking tin. Using oven gloves to protect from the heat turn the buns out of the tin. Again place a serving dish over the board flip over and the chocolate buns will be right side up, ready to be glazed. 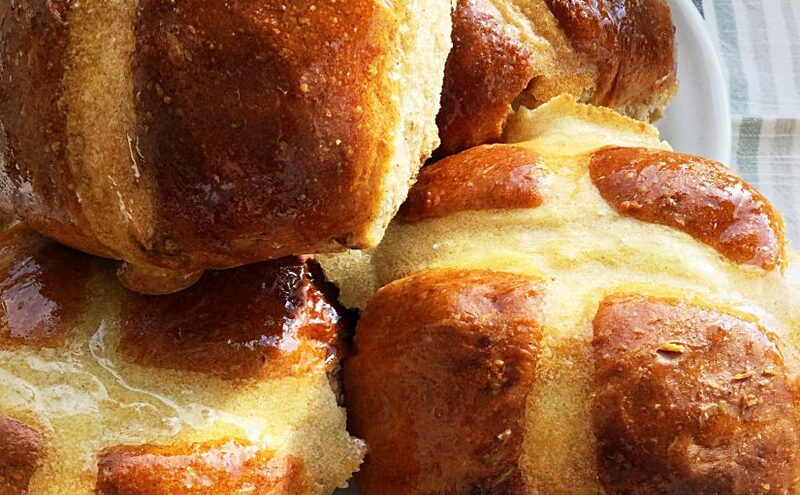 Use a knife to gently cut through where each bun joins the next. Move the buns so there is a small gap between them, this ensures the glaze can drip down the sides. Baking and turning out the buns. 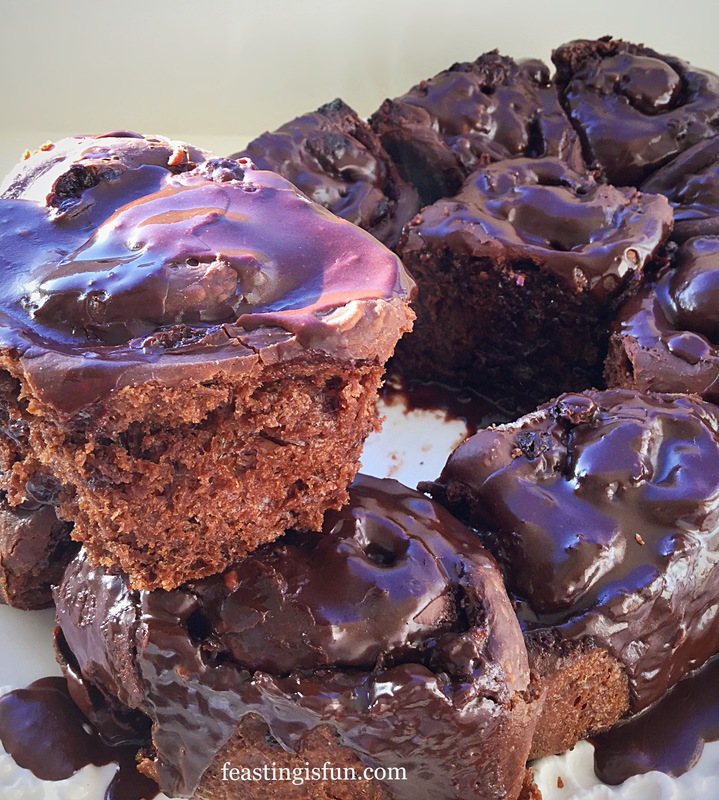 While the buns are still hot pour over the thick, glossy, chocolate icing. 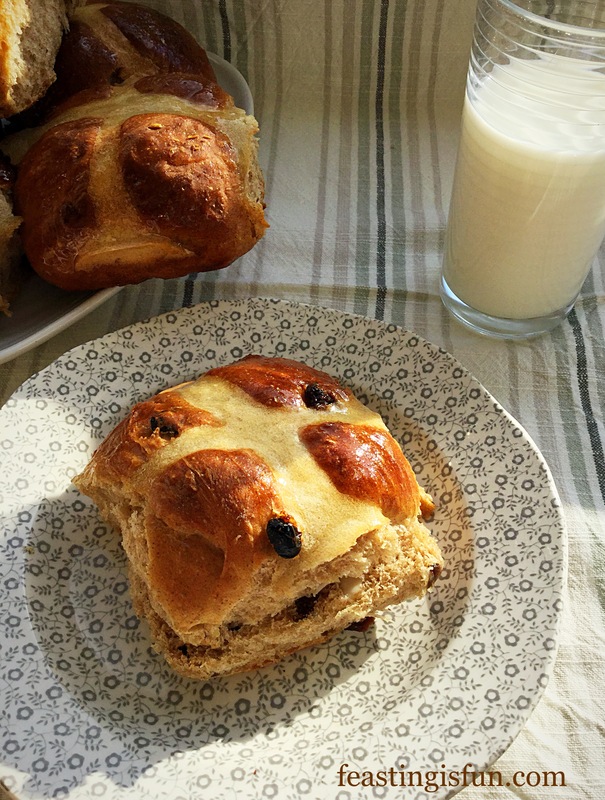 Serve the buns warm for breakfast as an extra special treat. While these buns are best eaten on the day they are baked they will keep for 2 days in an airtight container. A quick 10 second zap in the microwave warms cold buns ready to eat. Make ahead recipes are a great way to enjoy incredible feasts without having to get up early or spend all day in the kitchen. Because spending time with family and friends enjoying food together is always more important than being stuck in the kitchen, away from the fun. While it is fun to bake and cook together, not everyone has large, open plan kitchens that make this possible. 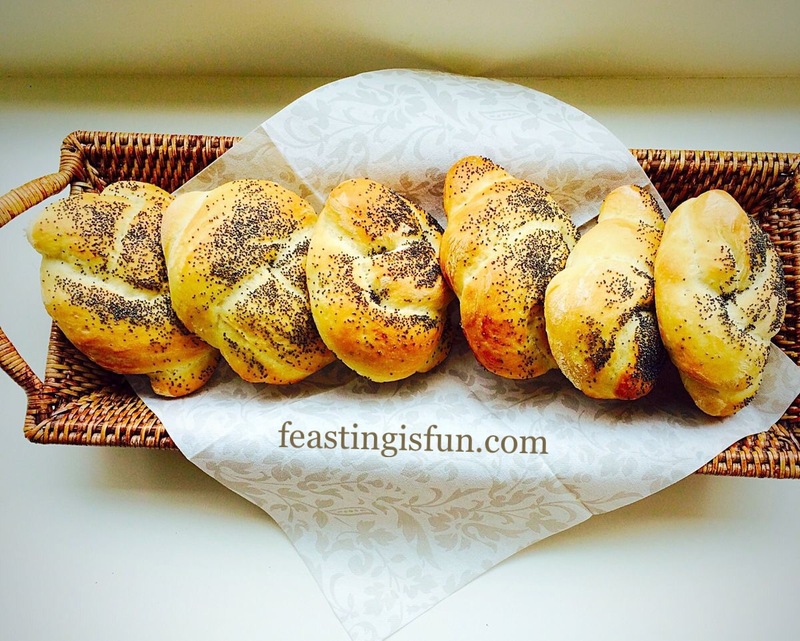 Therefore having this recipe enables you to serve freshly baked buns with minimal effort. 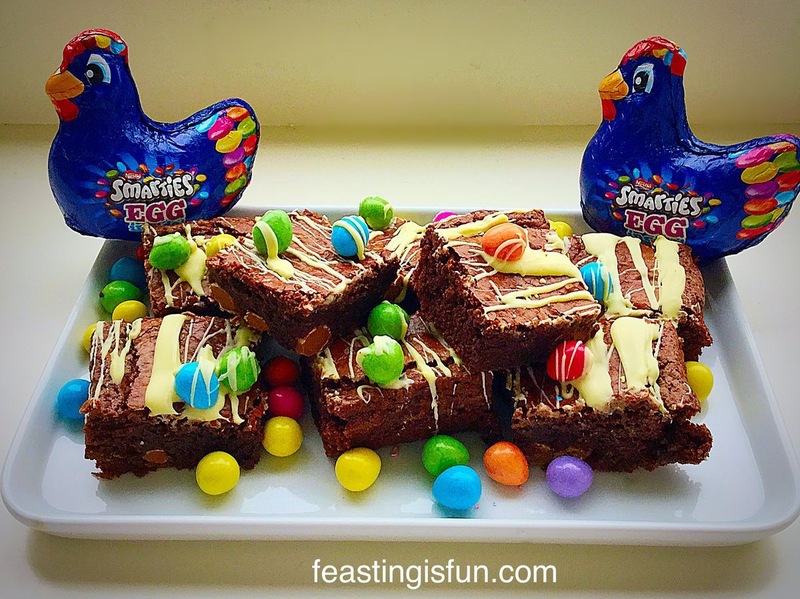 Would you like more make ahead recipes, here on Feasting is Fun? As you may have noticed from recent posts, I am having a full blown love affair with strawberries this Summer. Whether it’s eating them warmed by the sun, just as they are, or, creating new recipes such as Strawberry Rose Ice Cream, I cannot seem to get enough of them. While looking for inspiring ingredients on Amazon U.K., I found some baked strawberries for sale. Imagining a more intense strawberry flavour with a chewy texture. 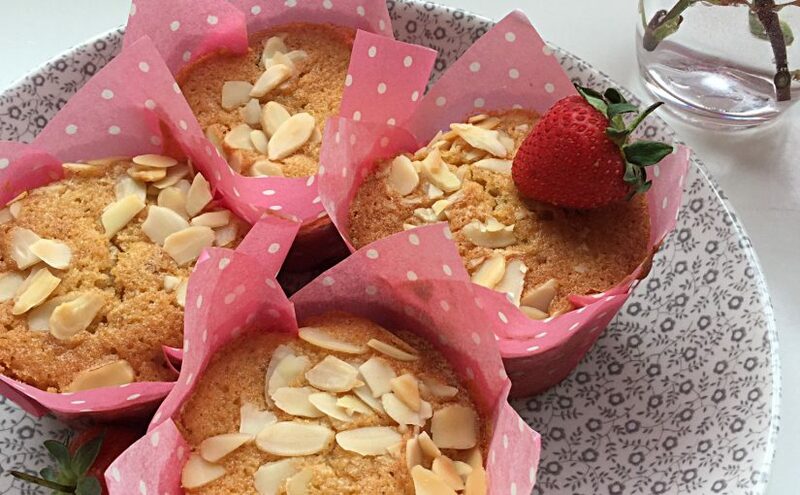 Sourcing locally, finally resulted in the creation of Double Strawberry Almond Muffins. 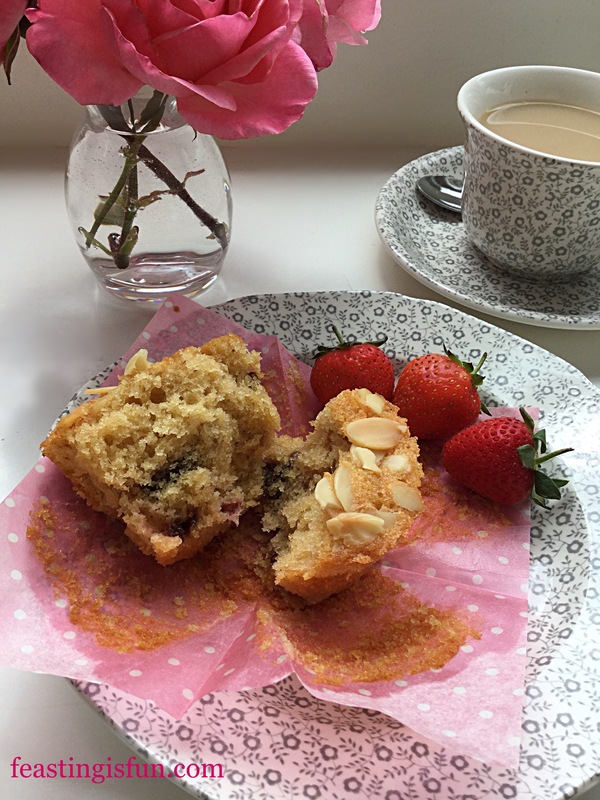 Double Strawberry Almond Muffins perfect for breakfast. Since the name ‘baked’ strawberries seems, a little misleading, they will be referred to as dried strawberries. Not freeze dried strawberries, which are an entirely different product altogether. Similar to dried apricots in texture, dried strawberries are chewy, rather like gummy bears, with a more intense, strawberry flavour. While also free from other added ingredients. Resulting in a perfect snack size strawberry, untainted by additives. 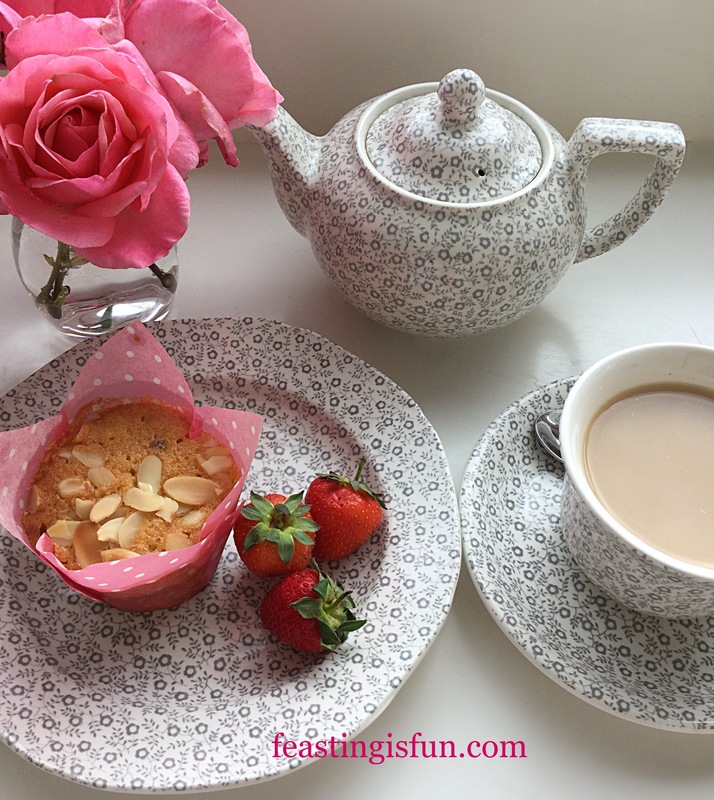 Double Strawberry Almond Muffins delicious with a cup of tea. While the muffins bake the fresh strawberries become absorbed into the batter. 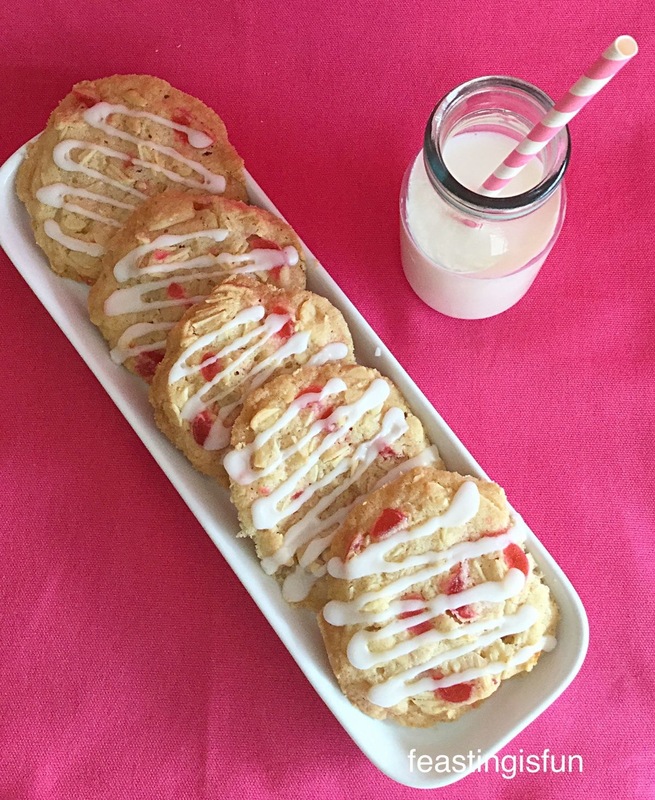 Yet dried strawberries absorb moisture from the cake batter. During the baking process they lose their chewy texture. Resulting in gooey, jam like pools of delicious strawberry within each muffin. Double Strawberry Almond Muffins dark pieces of dried strawberry within the muffin. A light open texture of each muffin is visible in the photo above. Having checked a few muffins, the strawberries are dispersed evenly throughout. Since previously having difficulty including fresh strawberries into a bake, I didn’t want to weigh the batter down with their water content. That said, extra chopped, dried strawberries could be added to the top, with the flaked almonds, prior to baking. Note: Tulip wrappers must be used in a deep muffin, or cupcake tin. 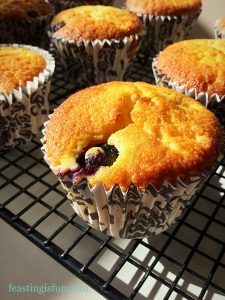 When using regular cupcake cases, fill two thirds full and expect to make 18 muffins from this recipe. The length of time baking will also need to be adjusted, please see guidelines in the method. Line a deep muffin tin with 12 tulip wrappers. Whisk together the butter, sugar and salt in a large bowl, until pale and creamy. Add the eggs, vanilla and almond extract and the chopped fresh strawberries to the bowl. Whisk together. 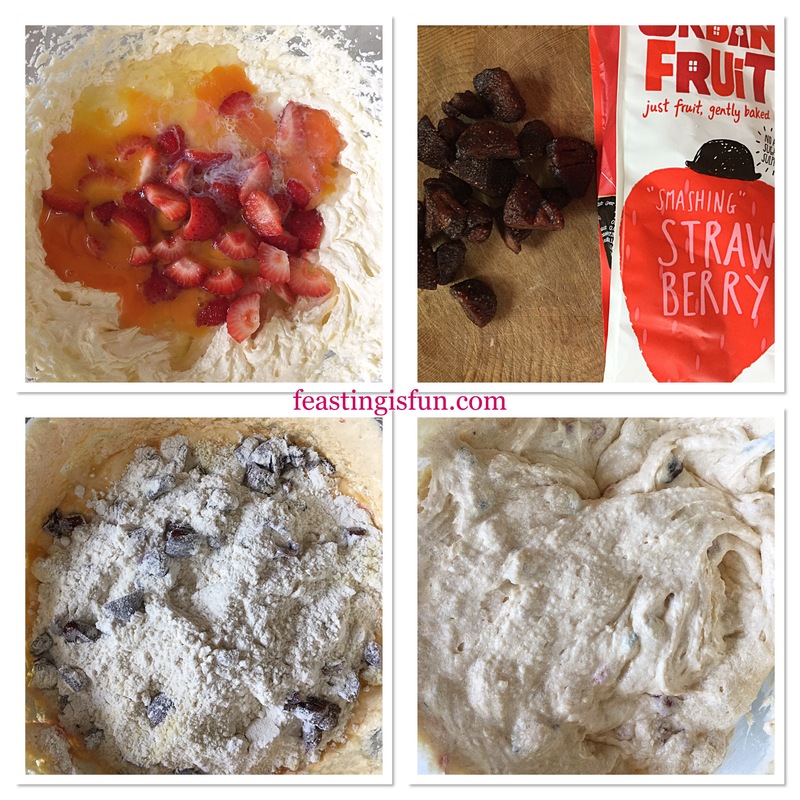 Next add the ground almonds, flour, baking powder and chopped dried strawberries. Tossing the strawberries in the flour will help stop them from sinking to the bottom of the muffin. Mix all of the ingredients together so that they are fully combined. Over mixing will cause the muffins to become tough. Using a large, 5cm/2″ ice cream scoop, add one scoop of batter to each tulip case. Divide any remaining batte evenly between the 12 cases. 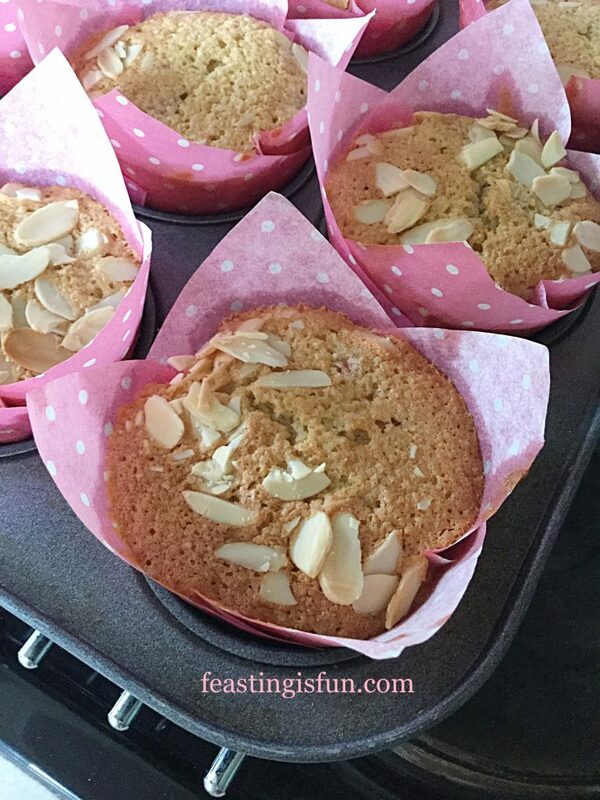 Sprinkle some flaked almonds on top of each unbaked muffin. Again dividing the almond flakes, so each muffin has an equal amount. 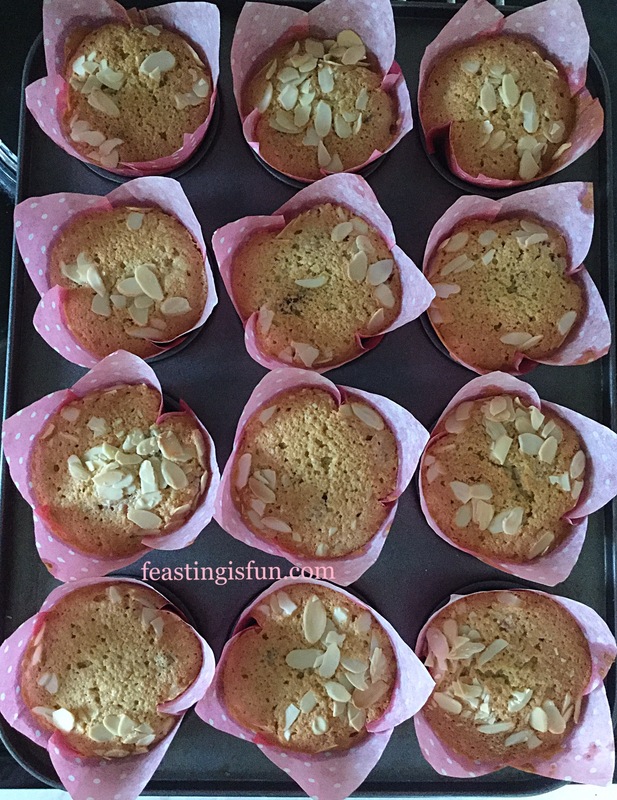 Adding flaked almonds to the top of each muffin before baking. Place the muffin tin into the centre of the oven and bake for 40-45 minutes. The muffins are baked when they turn golden brown and are firm to a light touch. Over cooked muffins will be dry so start checking at 35 minutes. Note: if baking using smaller cases, the baking time will need to be reduced. Double Strawberry Almond Muffins baked fresh from the oven. When using tulip cases leave the muffins to cool completely in the tin. For muffin/cupcake cases, leave to cool for 10 minutes in the tin and then transfer to a cooling rack. 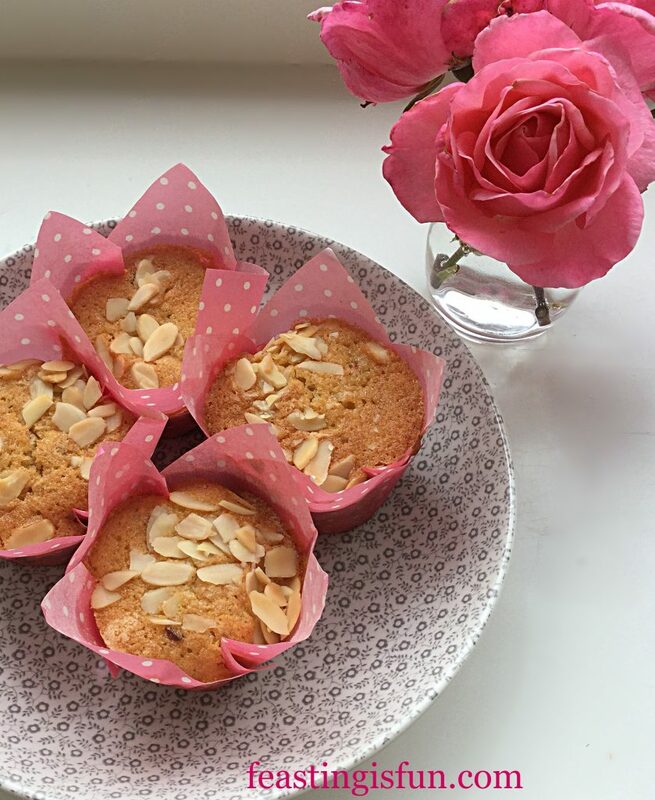 Double Strawberry Almond Muffins topped with flaked almonds. 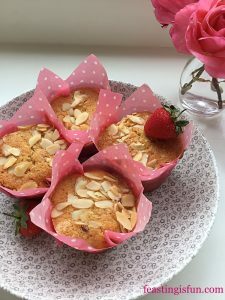 Double Strawberry Almond Muffins are best served slightly warm, or cold. Also a cup of tea, or fresh fruit juice served alongside is a great idea. 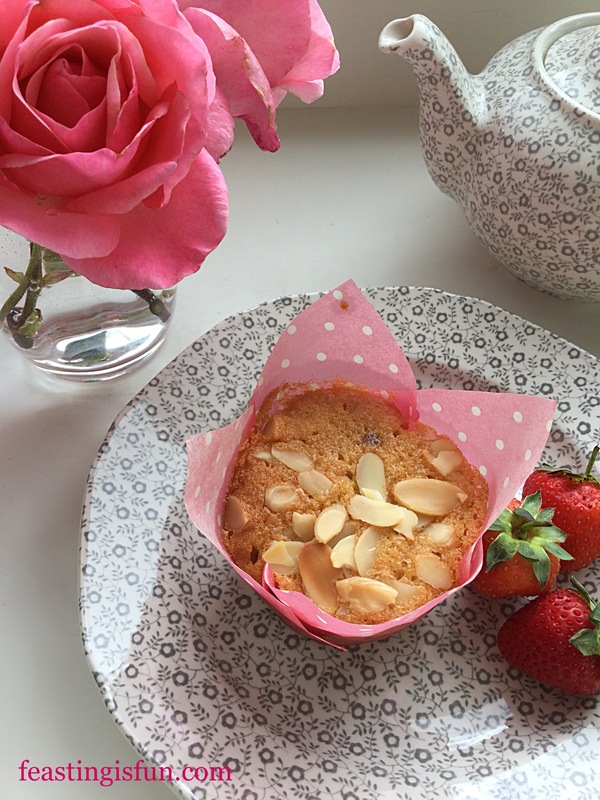 Double Strawberry Almond Muffins perfectly portable. Muffins are great for breakfast, packed lunches and beating late afternoon hunger pangs. Muffins containing fresh fruit are best eaten within 3 days of making. Store in an airtight container, placed in the fridge during hot weather. 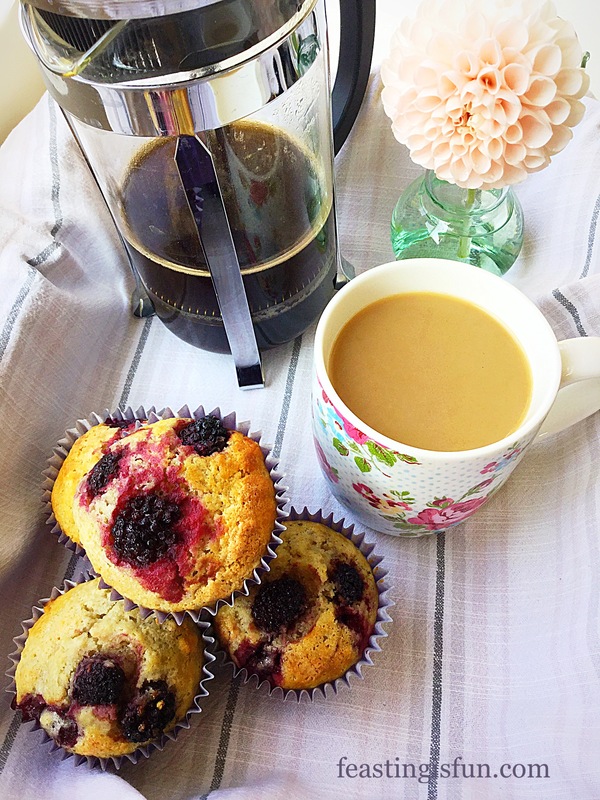 Taking under ten minutes to make, muffins really are a delicious breakfast treat. Knowing that, whilst at school, college or work, my family has good, wholesome food is important to me. Dried strawberries are widely available from supermarkets, including Ocado, Waitrose and Amazon U.K.
No part of this post may be reproduced without the explicit, written consent of the owner. For more details please see my Disclosure Policy. Nothing smells better than the aroma of homemade bread, baking in the oven. As many of my regular readers will know, I adore making bread. Yet sometimes, time is the enemy. Especially if it’s needed for breakfast and we have run out. 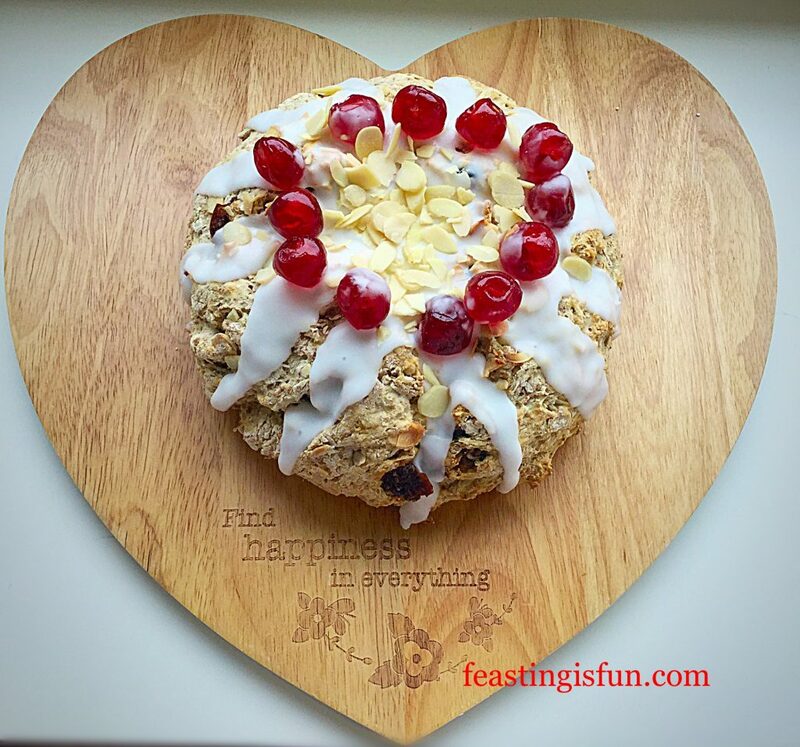 The solution is to bake this beautiful and delicious Cherry Bakewell Soda Bread. 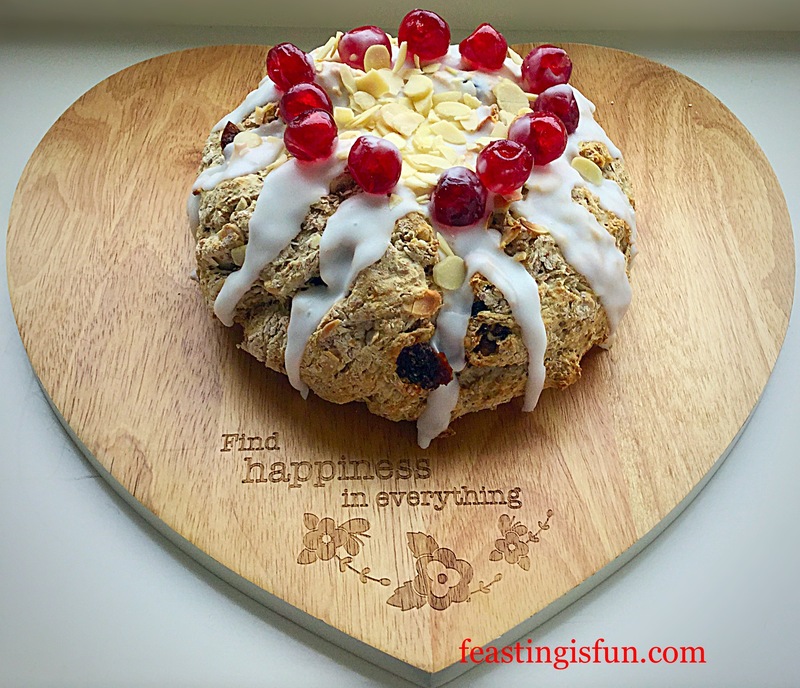 Cherry Bakewell Soda Bread crowned with cherries. 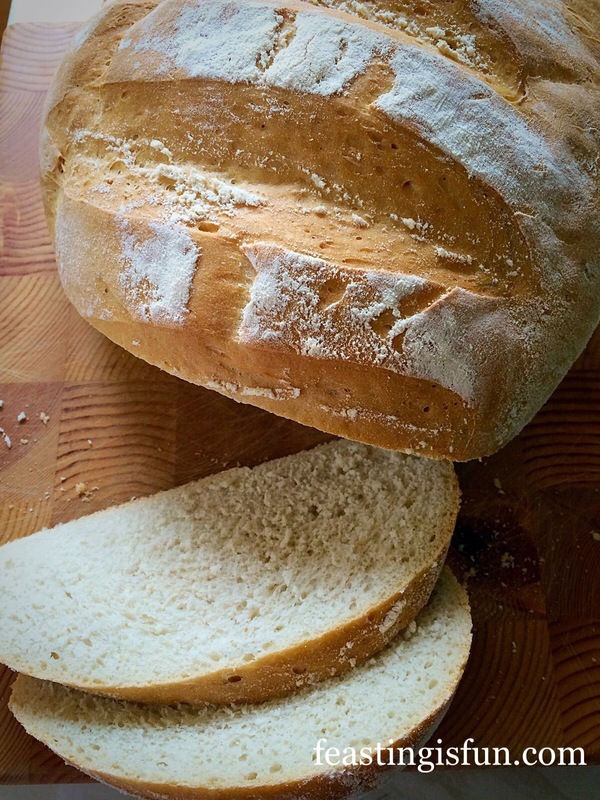 An un-yeasted bread, made even easier by using a packet of Wrights Scofa Bread Mix. All this tasty loaf requires is a little mixing, shaping and popping in a preheated oven to bake. 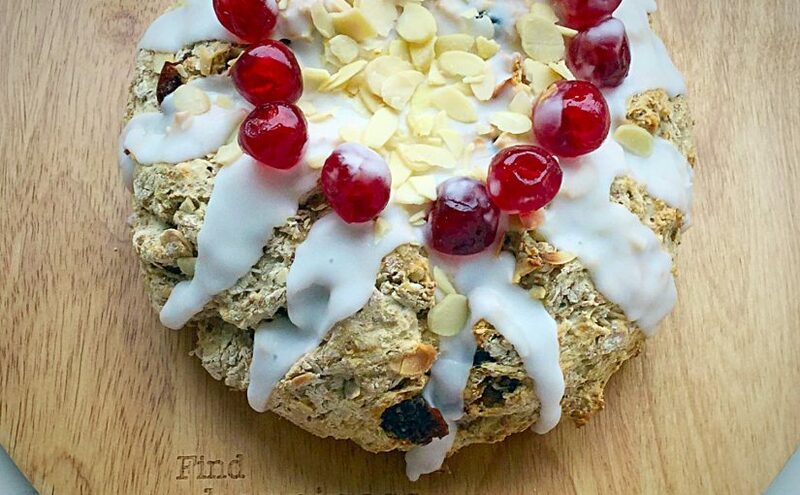 The addition of cherries and flaked almonds gives this loaf the wow factor. Especially with the almond flavour icing, temptingly drizzled over the loaf and finished with ruby red, glacé cherries. 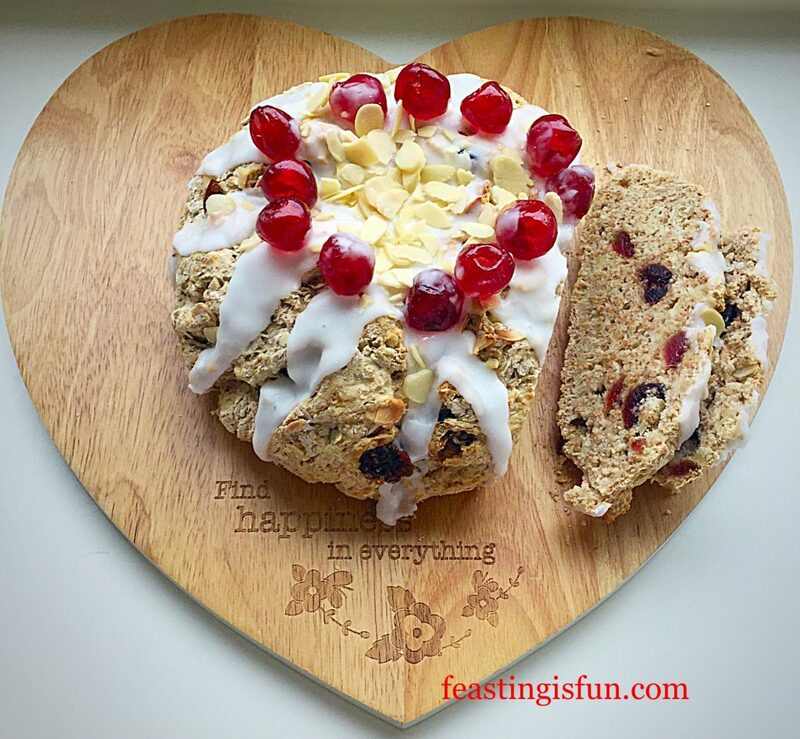 Cherry Bakewell Soda Bread hearty and delicious. 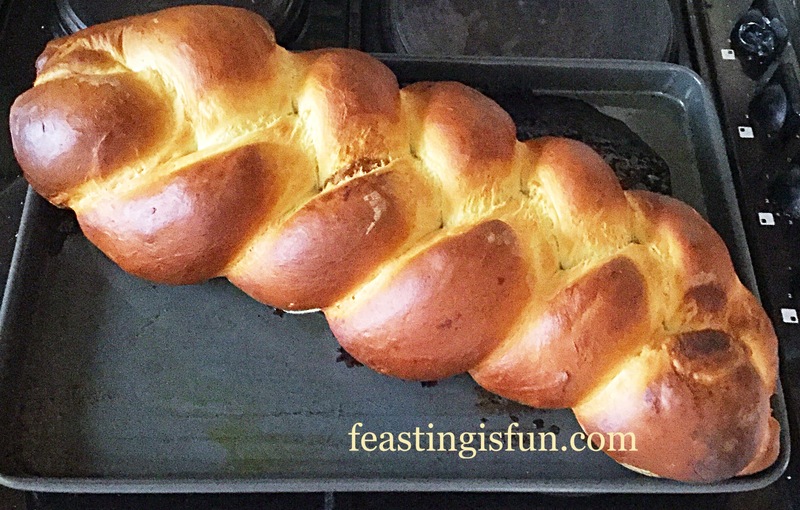 Since this loaf takes less than 45 minutes from start to baked, it is perfect for lazy weekend breakfasts. Still, if you are in a real rush, ditch the icing and crown of cherries and serve this sliced, warm from the oven, with butter if desired. 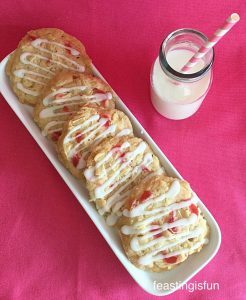 Cherry Bakewell Soda Bread perfect for afternoon tea. While this bread can be made and baked in under an hour, leaving to cool allows for simple, yet stunning decoration. 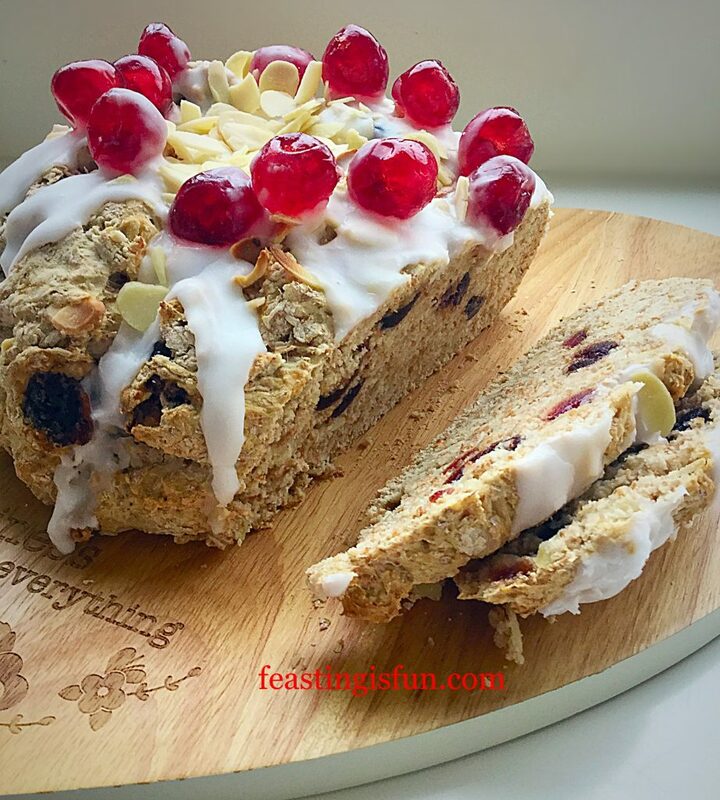 Thick, almond icing, draped over the rustic loaf, simply topped with jewelled cherries. Creating a sensation for the eyes as well as the palette. Cooled and sliced, I found this delicious, hearty loaf needed no further addition. 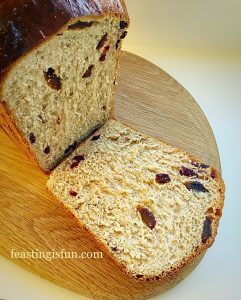 Each bite full of almonds, cherries and rustic, wholemeal bread. Method: Preheat the oven to 220C/200C fan, gas mark 7. First of all, remove 12 whole glacé cherries and set them to one side for decoration. Next cut all the remaining cherries in half. Place the volume of water, as specified on the packet, into a large bowl. Add 1 teaspoon of almond extract to the water. Swirl to mix. Add the entire packet of Scofa Bread Mix. Now add the cherry halves on top of the bread mix, lightly dusting them with the mix to stop them sticking together. Reserve one tablespoon of flaked almonds for decoration and add the rest to the bowl. Use a wooden spoon to stir the mixture until it comes together. Tip the dough out on to a lightly floured work top and shape into a round. 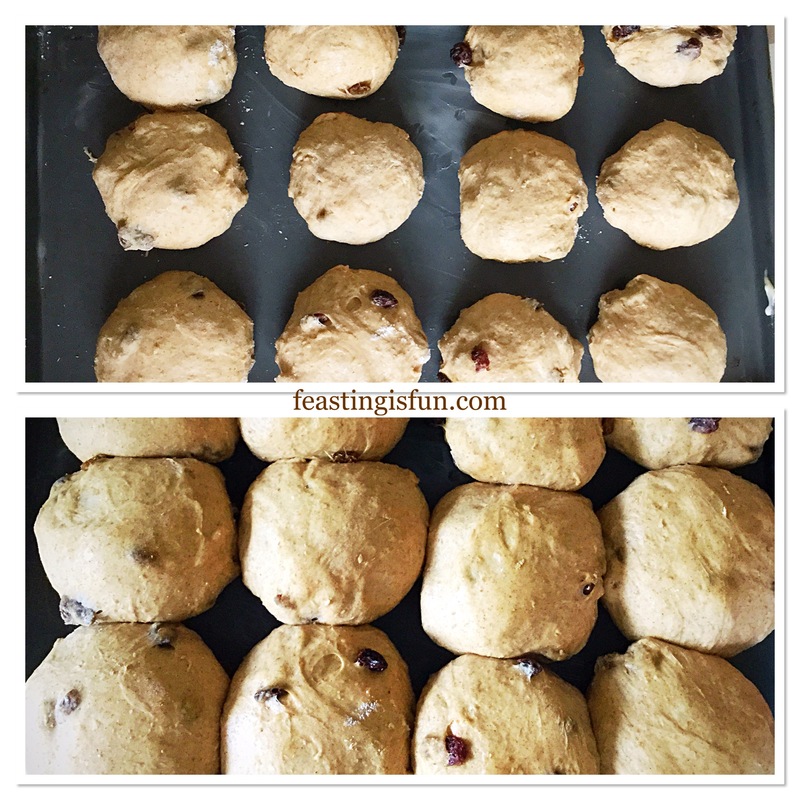 Place the shaped dough on to a greased baking sheet. 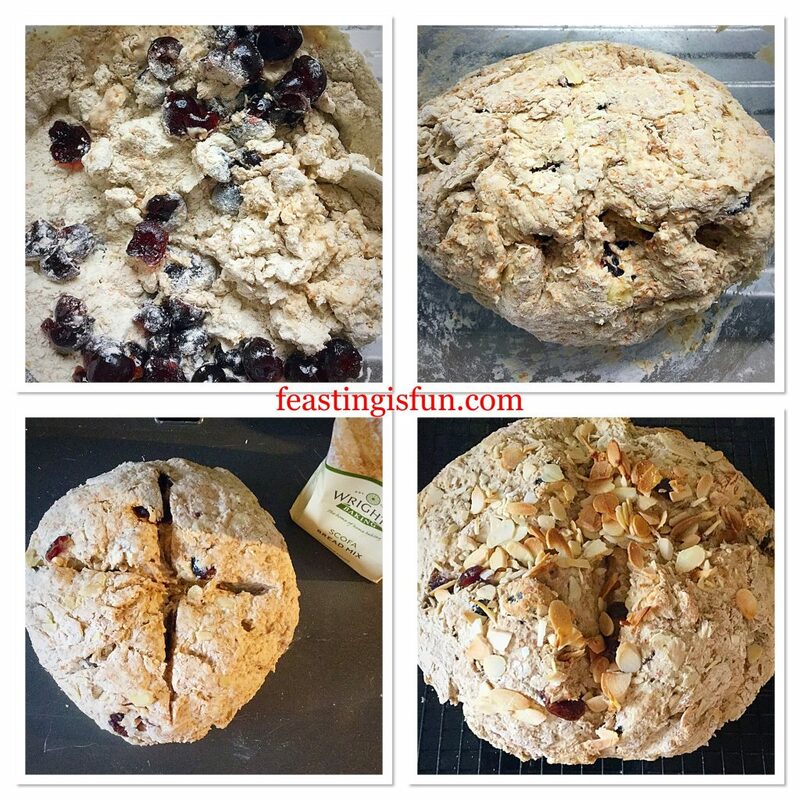 Cut a deep cross into the dough, if not icing, sprinkle the remaining almonds over the bread. Next place in the centre of a preheated oven. Bake the bread for 30-35 minutes. Once baked it will sound hollow when rapped on the base with your knuckle. 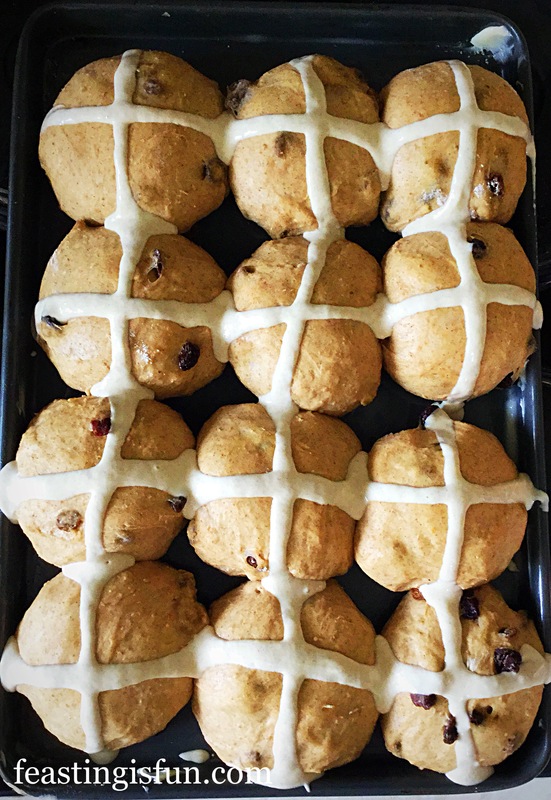 Note – this baking time is slightly longer than specified on the packet. This is due to the addition of cherries and almonds. 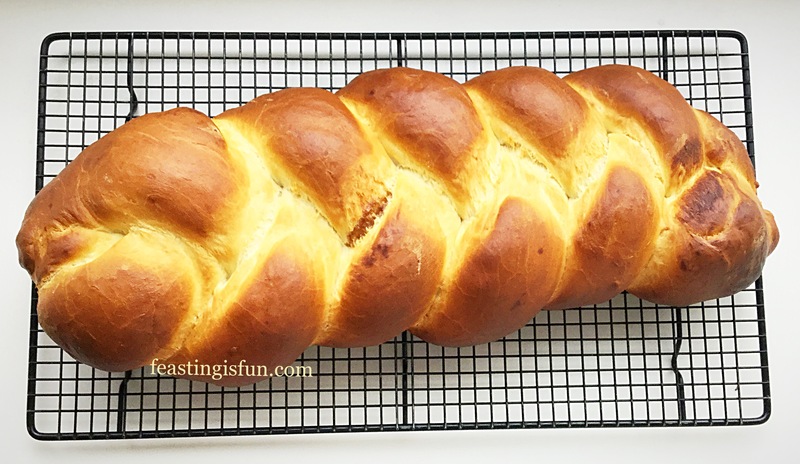 Once baked remove the bread from the oven and place on a cooling rack. Note – the bread doesn’t change colour very much whilst baking. 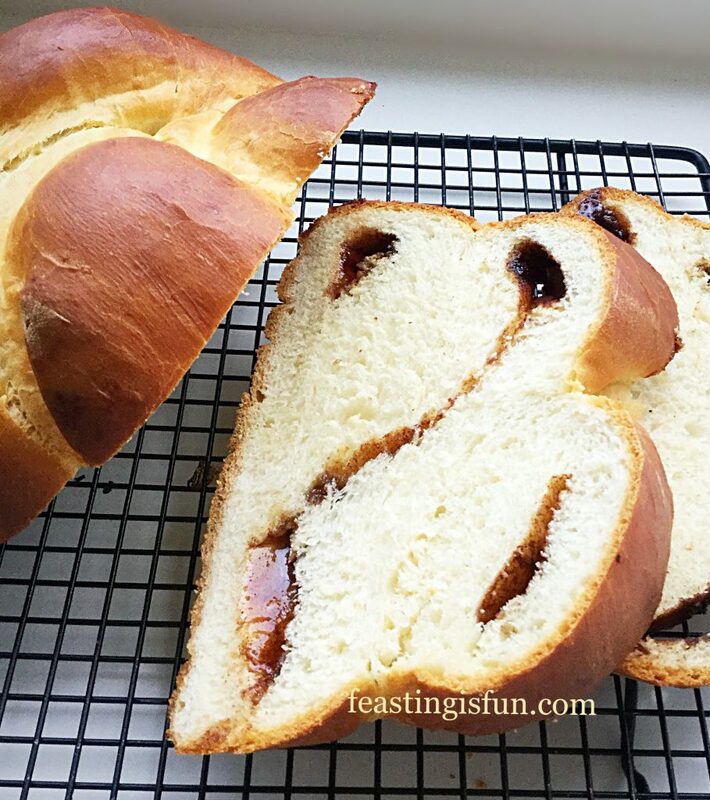 Allow the bread to completely cool before icing and decorating. To make the icing: Add 2 teaspoons of almond extract to the sieved icing sugar. Now add enough water, approximately one tablespoon, to the icing and stir. It should be a thick paste that can hold a figure of eight for a few seconds. Place the cooling rack with the bread on it, over a baking tray, to catch any drips. Start in the centre. Spoon thick icing over the bread, encouraging it to drape down over the sides of the loaf. 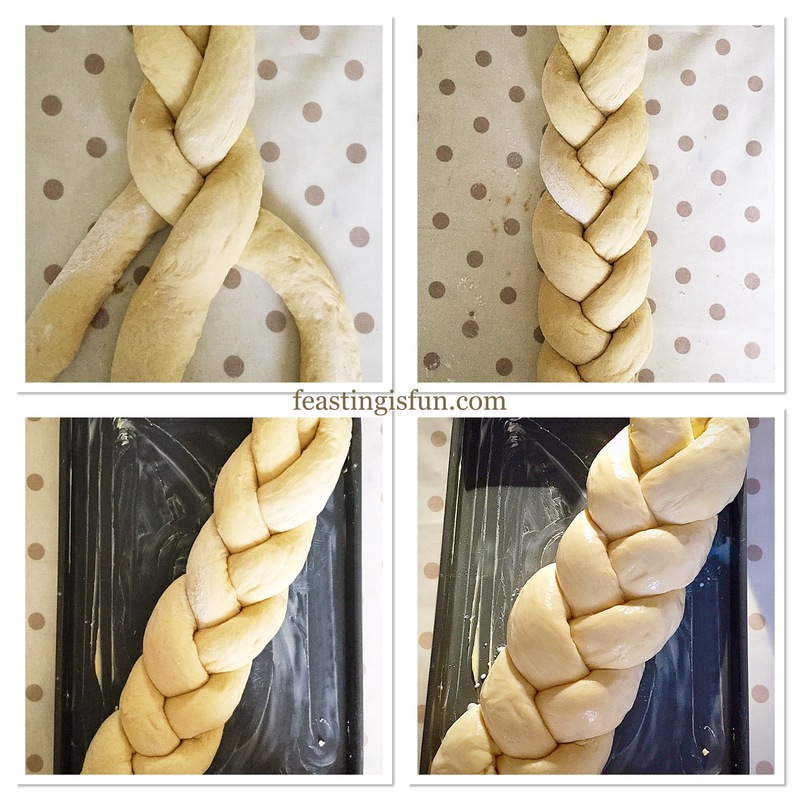 Continue until the bread is evenly drizzled with the icing. 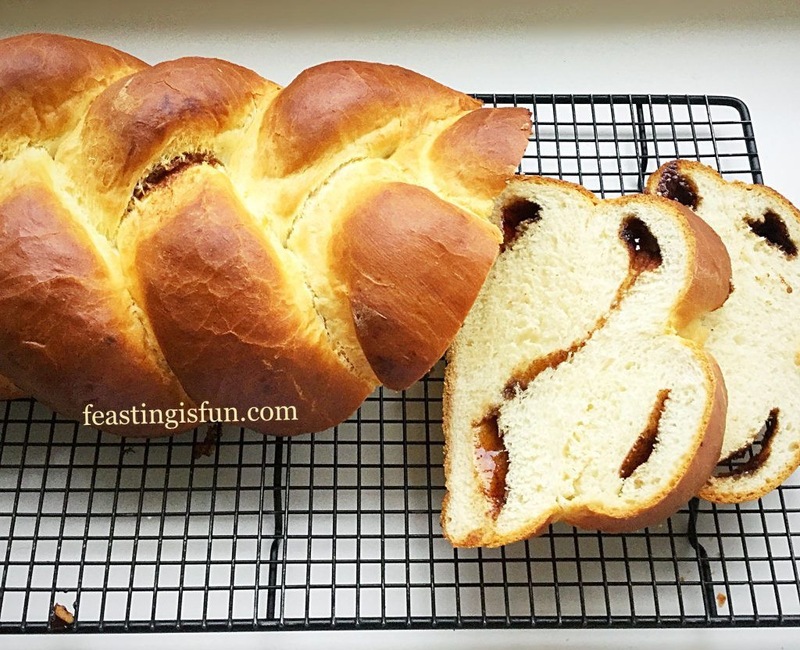 Next, place the reserved cherries on top of the bread, forming a crown-like circle. Finally, scatter the reserved almond flakes over the bread. Set the decorated bread to one side to allow the icing to set. 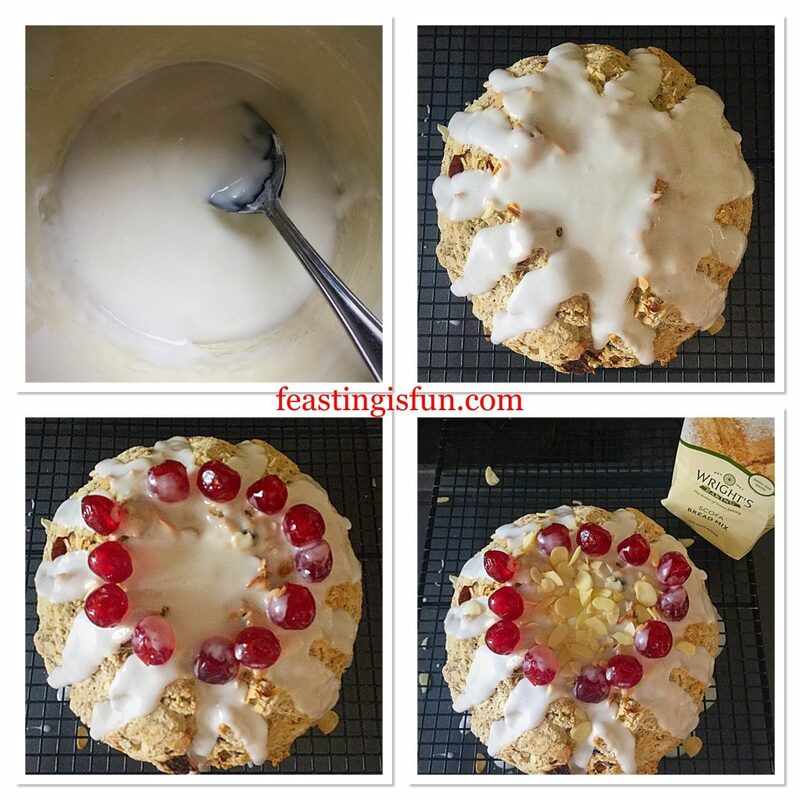 Cherry Bakewell Soda Bread deliciously easy to make. 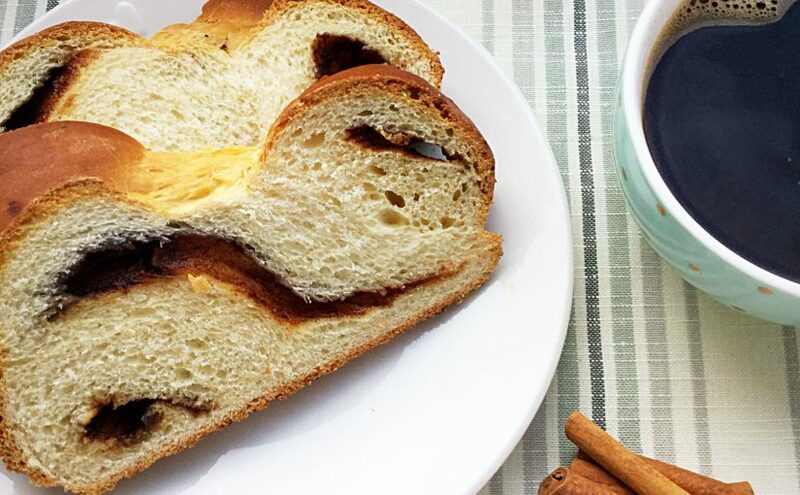 Serve this delicious bread sliced, for breakfast, lunch of afternoon tea. In fact, it is perfect for anytime of the day. Store in an airtight container. 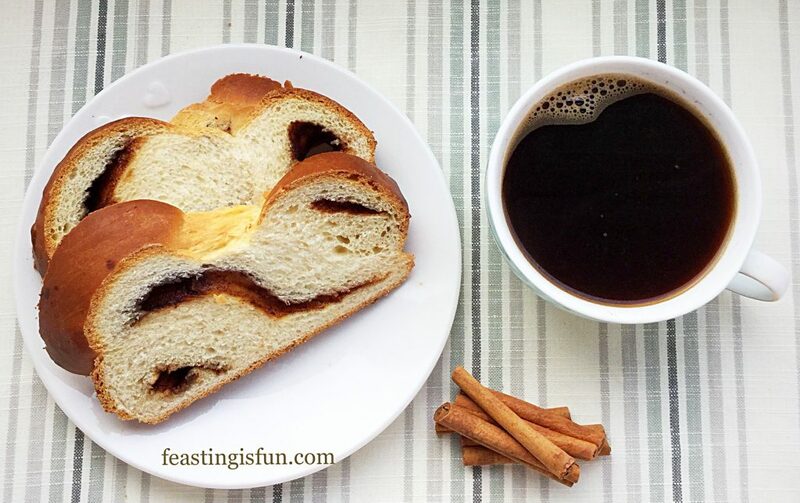 This bread is at its best when eaten wishing 24 hours of baking. That shouldn’t be too much of a problem! Making something different for breakfast at the weekend is a real treat. Whilst most of my baking is made from scratch, the convenience of having good quality packet mixes in the cupboard cannot be denied. Balancing time spent together as a family with, the time it takes to create a feast, is important. Do you make breakfast more of a treat at the weekend? After all, it is the most important meal of the day? Wrights Baking supplied me with the mix to create this recipe. All views, content and photography are my own. Please see my Disclosure Policy. Autumn is such a beautiful season. As leaves change through a rainbow of green, yellow, gold, orange and rust. Low sunlight casting a golden glow on days that are spared from wind and rain ravaged storms. Because Autumn is a season of transition. Summer salads gradually disappear, replaced by comforting soups, stews and roasts. While these Baked Pumpkin Spiced Doughnuts not only look autumnal, they warm the senses with long since forgotten spices. 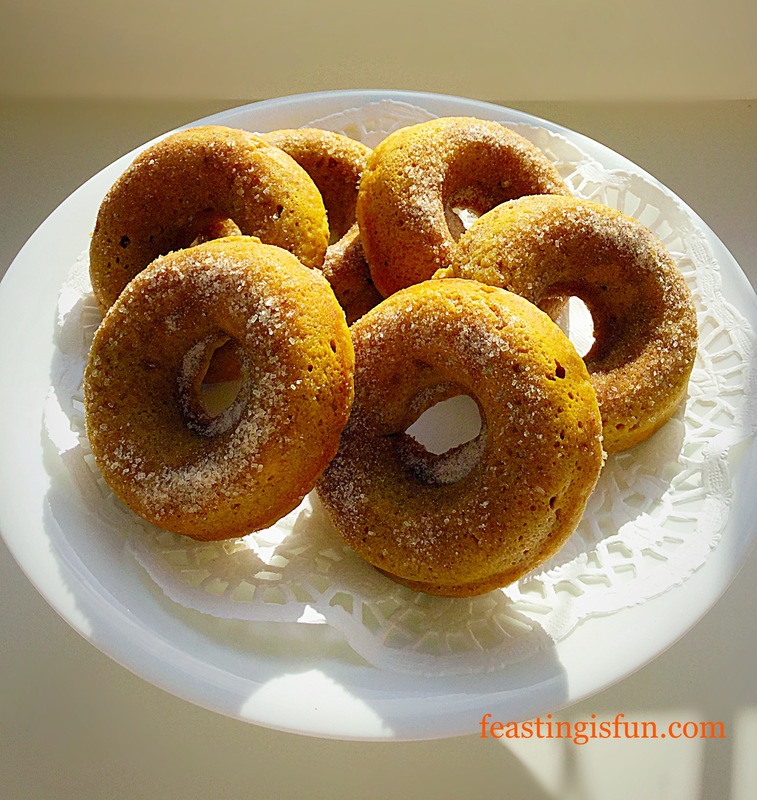 Baked Pumpkin Spiced Doughnuts so tender. 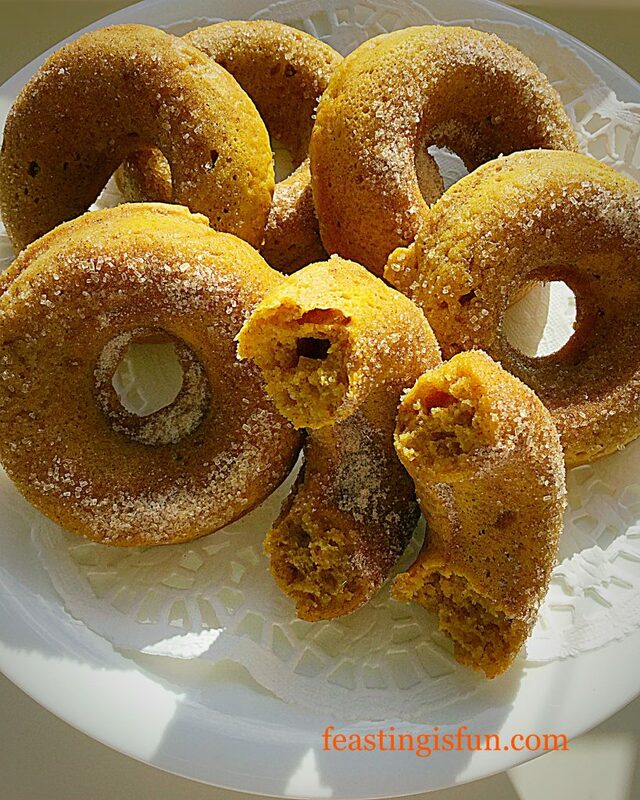 Inspiration hit to make these Baked Pumpkin Spiced Doughnuts after reading a similar recipe from Baker By Nature. Although I had never baked with pumpkin purée before, the first batch had me hooked. Since, as is the nature of most bakers, after testing, the recipe needed a little tweaking to accommodate our family’s taste preference, a second batch was the made the following day. 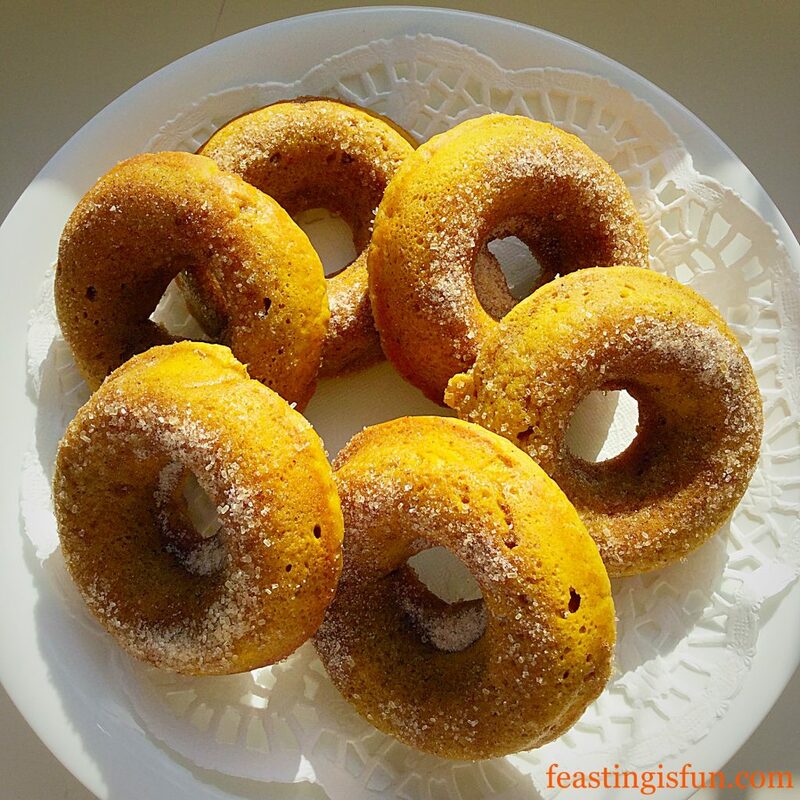 Baked Pumpkin Spiced Doughnuts such a warming, welcoming treat. 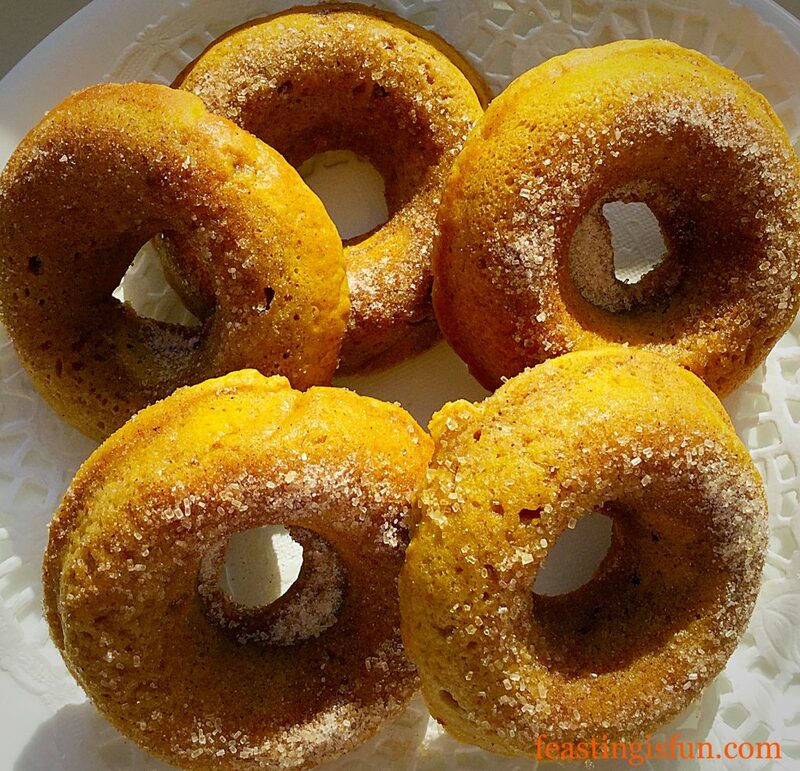 Baked Pumpkin Spiced Doughnuts you may fall in love with these. While the inhabitants of North America’s continent have been using pumpkin in pies, cakes and bakes for many years, over the pond we have been missing out. It seems that here in the U.K. we tend to carve out a stinky, cabbage smelling pumpkin at Halloween, without a thought to eating the flesh. Yes I know we eat butternut squash, in fact I put it in this Roasted Garlic Butternut Squash Soup. Yet, I cannot feel as though we are losing out. 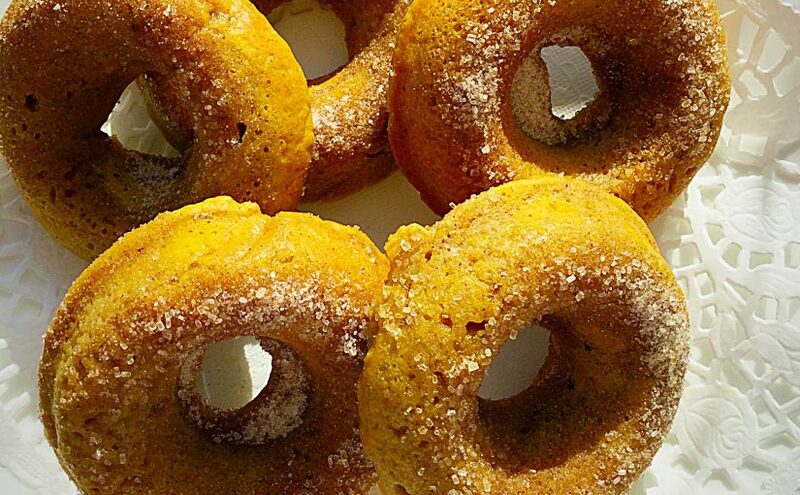 Pumpkin purée lends a tenderness to the crumb of these doughnuts that has to be tasted to be believed. The flavour is subtle, allowing the pumpkin spice mix to compliment, rather than overwhelm it. Finishing with a sprinkle of cinnamon spiced sugar creates the contrast in texture and awakens the senses. Resulting in a not quite as light as a fried doughnut, yet delicious in its own right. Baked Pumpkin Spiced Doughnuts all natural colour and flavour. Mix together and store in an airtight jar. 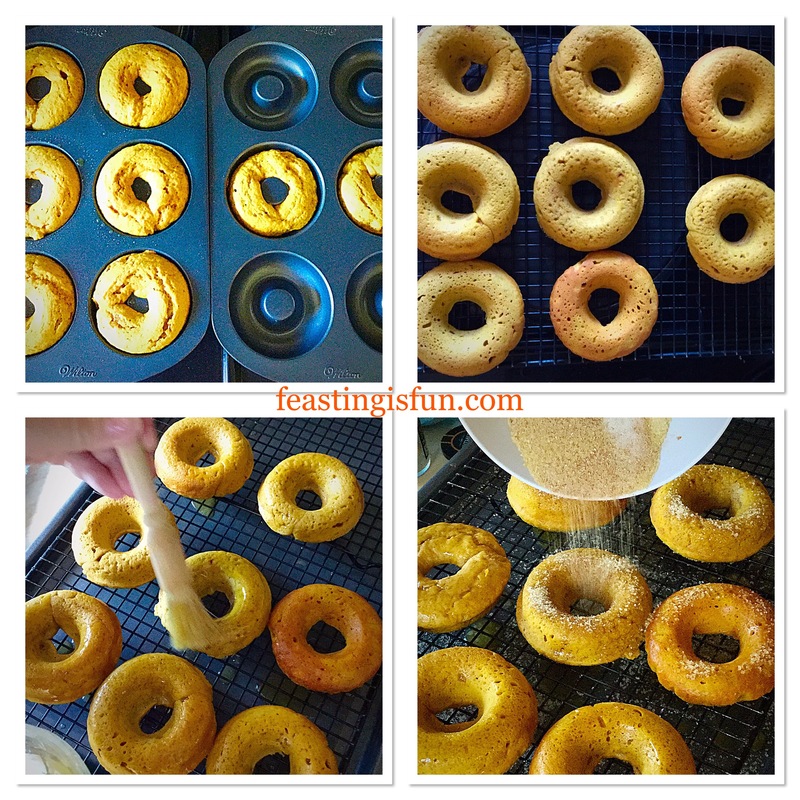 50g Unsalted Butter – melted and cooled plus extra butter for greasing the doughnut tin. Preheat the oven to 180C/160C fan, gas mark 4. The baked doughnut tins I use are from Wilton and on testing did not need greasing. However, brushing the doughnut tin with melted butter is recommended. In a large bowl add the flour, sugar, baking powder, salt and pumpkin spice. Stir with a balloon whisk, breaking up any lumps in the sugar. Dry ingredients. In a jug or smaller bowl add the pumpkin, yoghurt, egg and melted butter. Whisk together lightly with a fork until the mixture is a uniform orange colour. Wet ingredients. Make a well in the centre of the dry ingredients and pour the wet ingredients in. Stir with a spoon until just combined. Similar to making a muffin mix. Fill a piping bag, fitted with a circular nozzle, approximately 1.5 – 2 cm diameter, with the doughnut batter. Pipe 7-8 doughnuts into the tins. 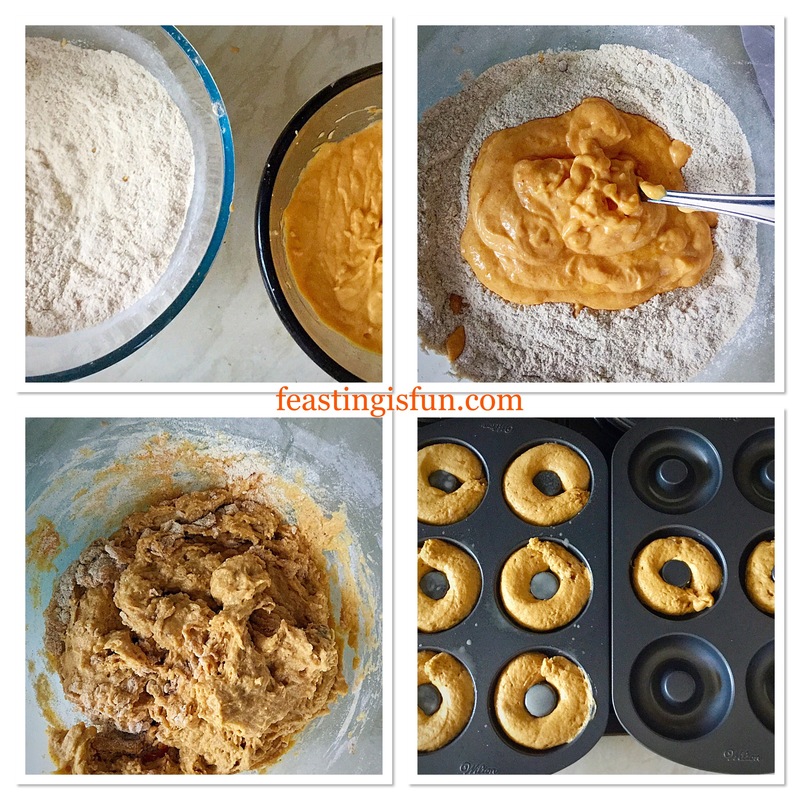 Baked Pumpkin Spiced Doughnuts in the making. Place the doughnut tins in the centre of the oven and bake for 13-15 minutes – mine took 13 minutes. The doughnuts will be firm, with a little spongy give when pressed, slightly golden and look a little crinkled on top when baked. As soon as the doughnuts are baked remove from the oven and immediately tip out on to a cooling rack. While the doughnuts are cooking melt the butter to dip them in. 30 seconds on medium was sufficient in our microwave. Ensure the bowl is big enough to take a complete doughnut if you choose to dunk. Next place the sugar and cinnamon in a bowl, ensuring it is big enough as before and mix to combine. While the doughnuts are still warm, dunk, or as I did, brush all over with melted butter. Remembering to turn the doughnut to ensure even coverage. Immediately after either dunk the doughnut in the spiced sugar, or sprinkle over the sugar while the doughnuts are on the rack. Coating the Baked Pumpkin Spiced Doughnuts in butter and spiced sugar. In reality, brushing with butter used exactly the same amount as dunking them. The choice really is yours. As a family, although utterly delicious, we decided that the first batch of doughnuts were too sugary. Yes that really is possible 😉. Finally, when dunking the doughnuts in the sugar, the butter made the spiced sugar damp. An example of this can be seen in the photograph below. Therefore, I decided to sprinkle them with sugar, resulting in less sugar sticking, whilst keeping its sparkly appearance. 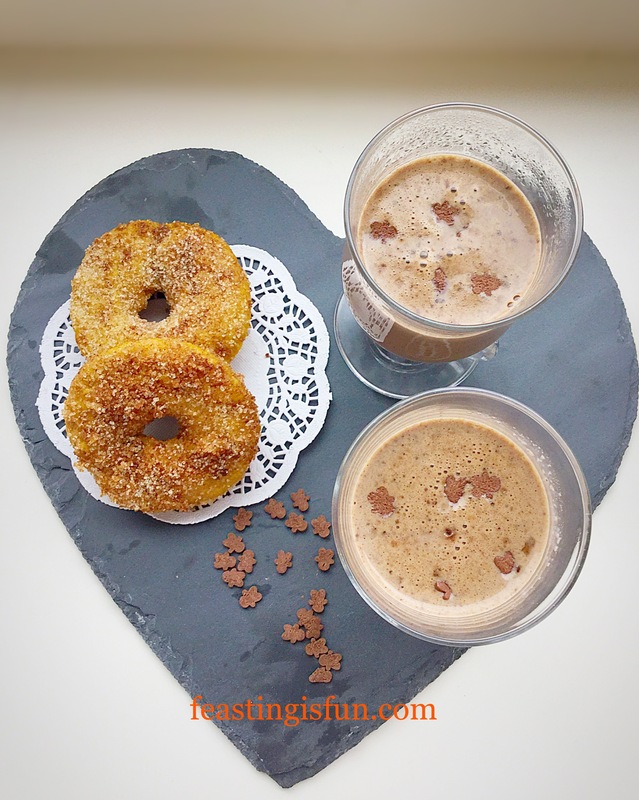 Baked Pumpkin Spiced Doughnuts accompanied by hot mocha drinks with a dash of ginger syrup. Serve immediately, with a warming drink. A Mr Sherick’s Chocolate Chip Latte Shake was heated in a jug with a little extra milk, poured into fancy glasses and given a splash of bla ginger syrup. The drinks were then topped with mini gingerbread sprinkles. Resulting in a Cafe Culture experience at home. 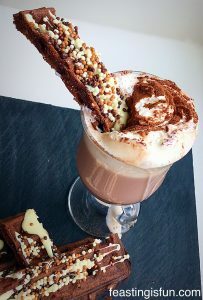 Finally, for those of you who would rather not, or cannot go out, especially when the weather is bleak, here is the ultimate Cafe treat! When served slightly warm I think that these doughnuts truly are at their best. While the recipe makes 8 individual Baked Pumpkin Spiced Doughnuts unless you are baking for more I really wouldn’t recommend doubling it. Because the preparation time is scarcely 10 minutes max and these are definitely better eaten the day they are made. That said, kept in an airtight container they will last an extra day. Pinged for 10 seconds in the microwave and they are almost back to freshly baked tenderness. Why not take a look at my friend Becky’s blog? It’s full of fantastic recipes and is written in a step-by-step style. You are sure to enjoy her Pumpkin Spice Pumpkin Bisuits. Today is National Waffle Day – as if we need a special day to eat delicious waffles – right 😉? So in the true spirit of Feasting is Fun, I decided to test Wright’s Baking new Orange Cake Mix out in my waffle maker. Oh boy are you going to be glad I did. 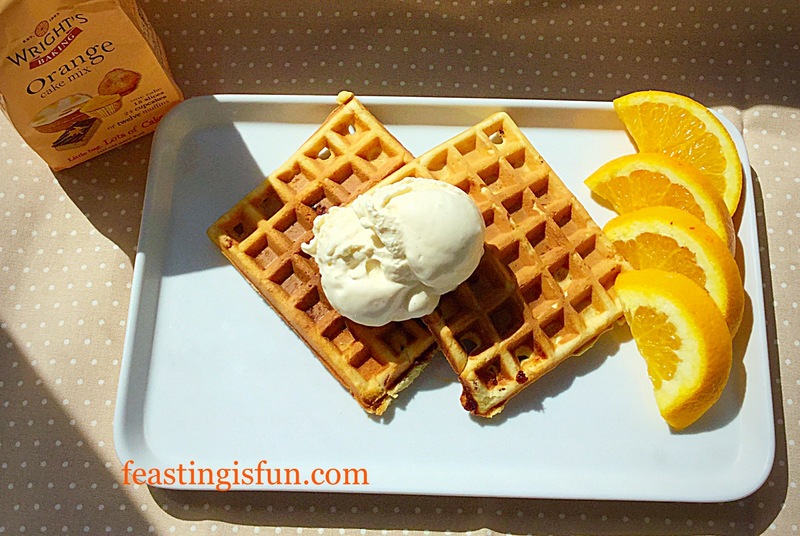 These Fruity Orange Waffles are simply amazing! 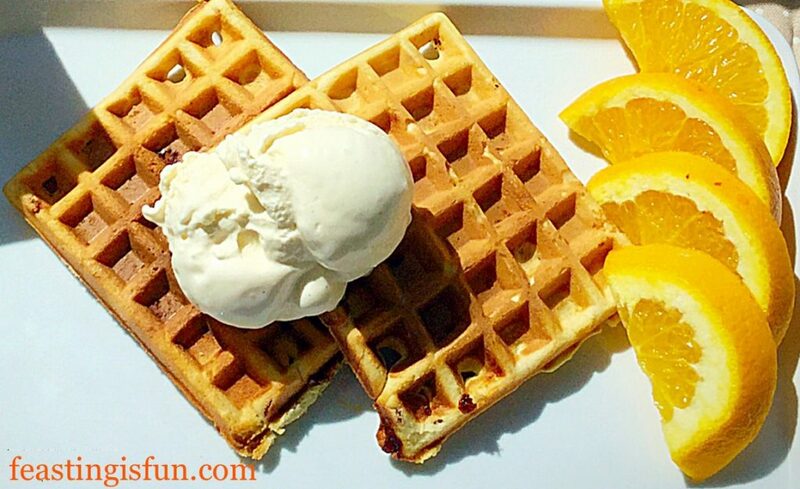 Fruity Orange Waffles delicious with ice cream. Not only are they an absolute whizz to make – literally 2 minutes and you’ve got Fruity Orange Waffles batter ready to go, they cook beautifully in the waffle maker. 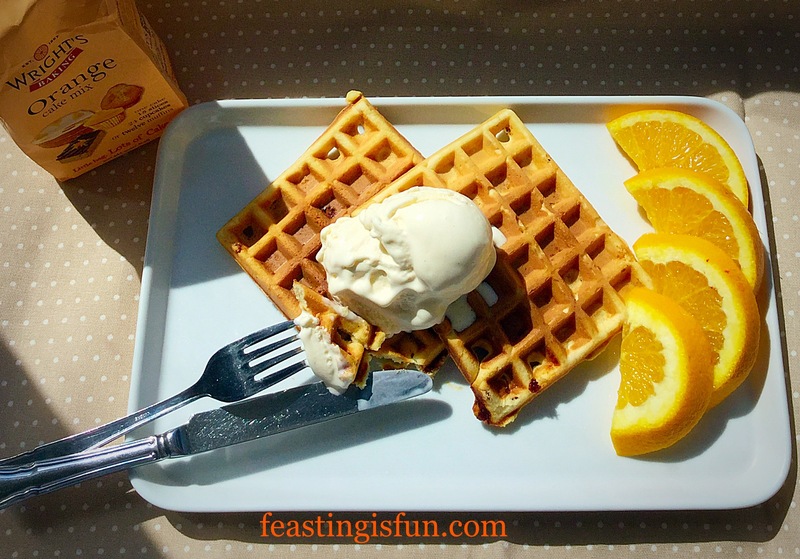 Fruity Orange Waffles an easy, delicious treat! 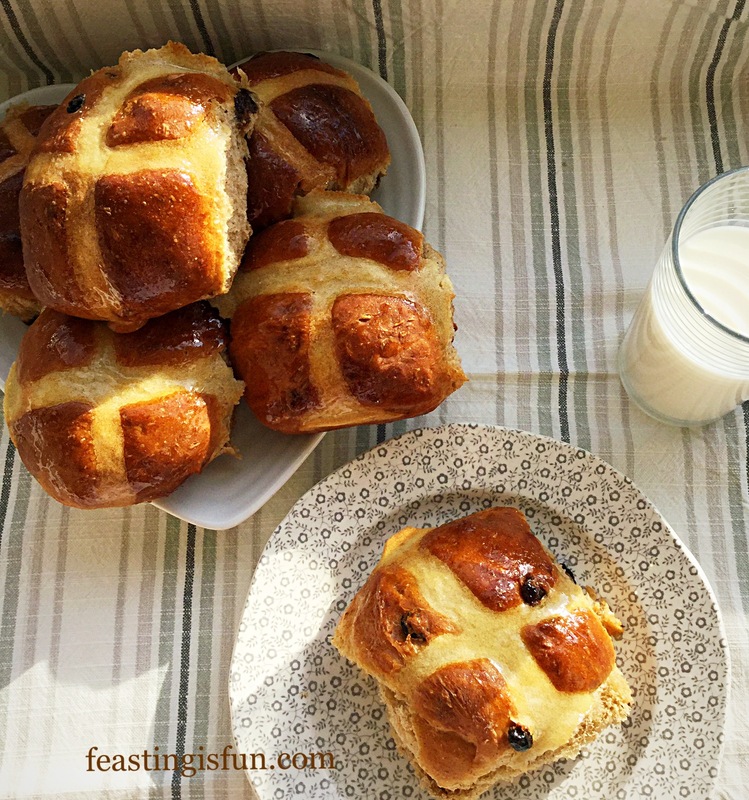 We had these for brunch this morning and I was so pleased I didn’t have to cook. Ok I switched the waffle maker on see Andrew James Waffle Maker Review, but it didn’t take long to cook 9 waffles from one packet of mx. Plenty for the four of us, oh and with a tub of homemade Very Vanilla Ice Cream, fresh oranges and strawberries. We had a Feast! Fruity Orange Waffles perfect any time of the year. It is now 30C outside – at least! We may well be having waffles for dinner if the house gets any hotter!! Method: Prepare your waffle maker according to it’s manufacturer’s instructions. With my waffle maker I brush the cold waffle plates with cooled, melted butter, prior to heating, hence the additional butter in the recipe. Switch the waffle maker on and allow to fully heat, until the ready light comes on. Whilst the waffle maker is heating up, in a medium bowl add 200mls of water and 60mls of melted butter. Next add the Orange Cake Mix and stir until the batter appears smooth – note, the cake batter has pieces of fruit in it so there will be small lumps, that is normal. This is how the waffle/cake batter will look. 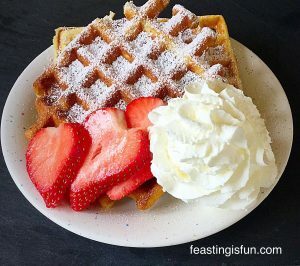 When the waffle maker is ready, remembering to protect your hands with oven gloves, open it and spoon a dessert spoon (like the spoon in the picture above) in the centre of each waffle plate. Close the waffle maker and cook for exactly 4 minutes. It really is worth setting a timer, especially if in four minutes you get little jobs done in the kitchen! Just sayin’ I’ve not burnt a waffle yet – for a reason 😉. After 4 minutes open the waffle maker (again protect yourself with gloves). The waffles will be fully cooked but not hard. Fully cooked Fruity Orange Waffles ready to be removed from the waffle maker. I use a wooden spatula to gently lift the waffle from the waffle maker. The Fruity Orange Waffles harden slightly on cooling and can easily be picked up by hand – just in case you want to try it dunked in your coffee/hot chocolate 😉. Repeat the process of spooning batter on to the waffle plates until it is all used up. 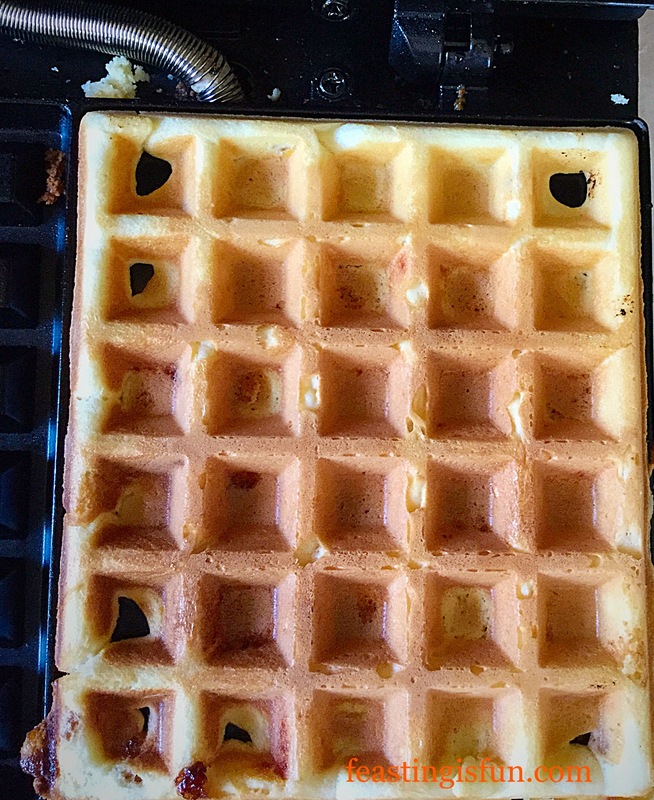 Top Tip: I would much rather have a waffle with slightly frilled edges, where not quite enough batter has been added, than a perfectly square one with waffle batter oozing out of the side of the waffle maker. I got lucky with the waffles I made, cleaning gooey, stuck waffle batter is no fun! 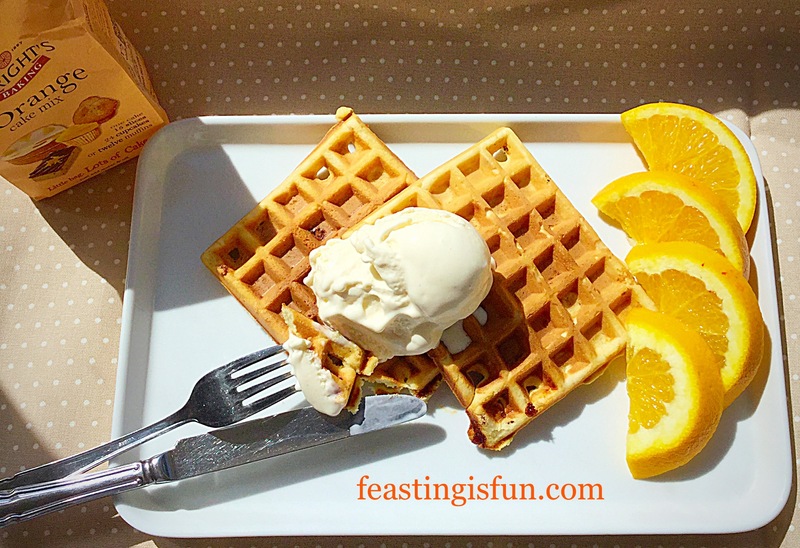 Fruity Orange Waffles add ice cream, fresh fruit and your imagination! 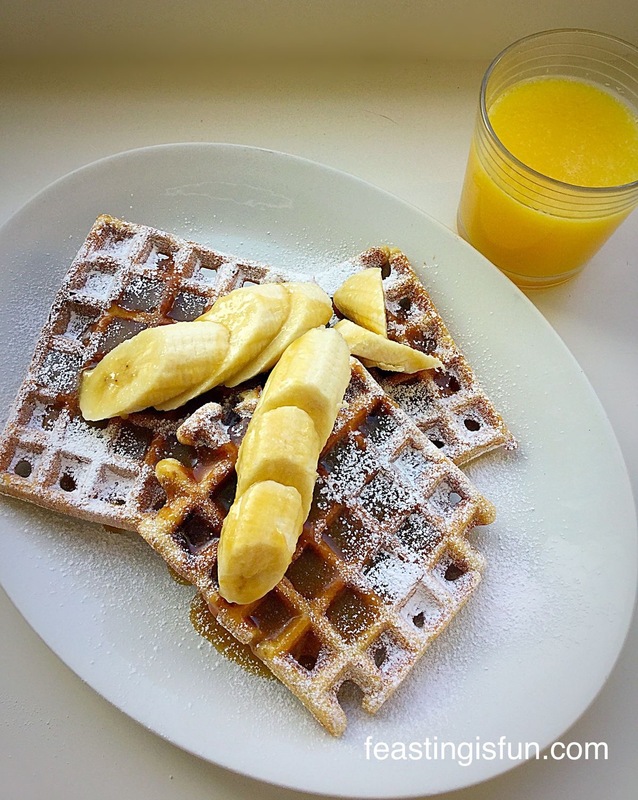 These delicious Fruity Orange Waffles can be served warm or cold. They will keep for up to 3 days in an airtight container and can be popped in the toaster to warm up. I like to serve these with cold vanilla ice cream and plenty of fresh fruit. You choose how to serve yours. They are deliciously light with delightful pieces of fruit that lend texture and extra flavour. If you like waffles you will love these. Toffee Banoffee Waffles also made using Wright’s Toffee Cake Mix. Chocolate Dunking Waffles everyone should try these at least once in their lives. 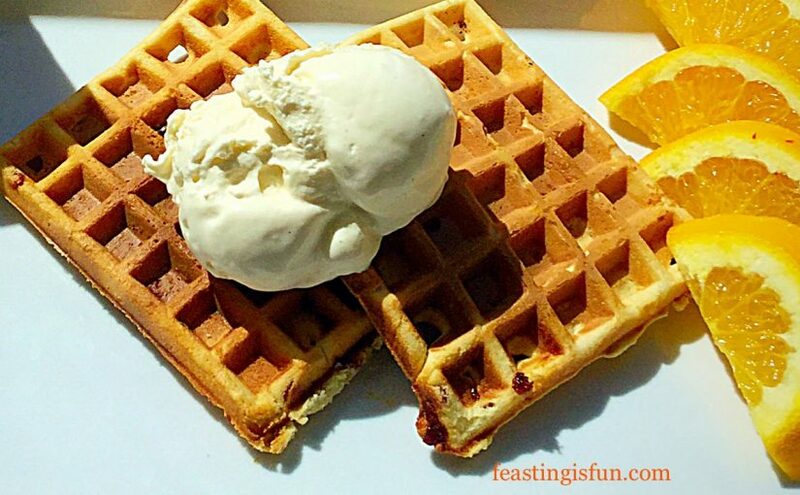 Vanilla Bean Waffles so delicious and versatile. Waffles are such an amazingly fun food. They can be sweet or savoury and topped with a myriad of different things. Let your imagination run wild and make waffles. Not just because it is National Waffle Day, but because they are so much fun and so tasty!! Wright’s Baking provided me with the cake mix to make these waffles. All opinions, views, content and photography are my own. I was not paid to write this post please see my Disclosure Policy. 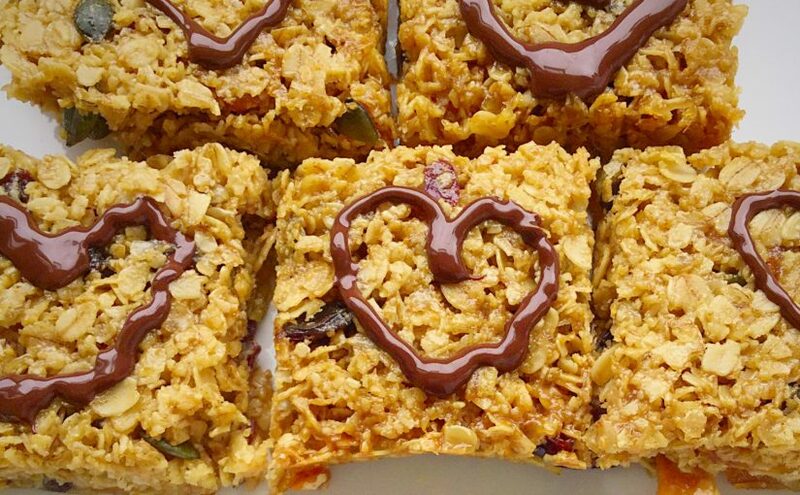 Muesli Flapjack Squares are THE answer to rushed mornings and missed breakfasts. 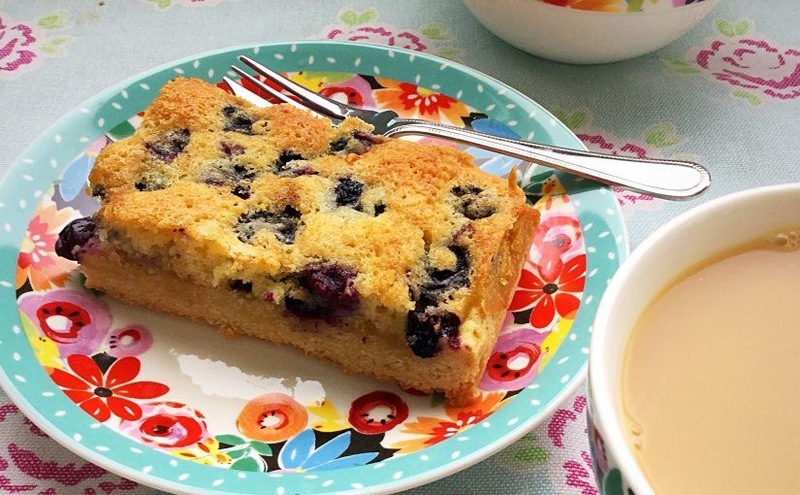 Make these at the weekend and you’ve got brekkie covered for the whole week. Ooh and did I mention they’re gluten free too! 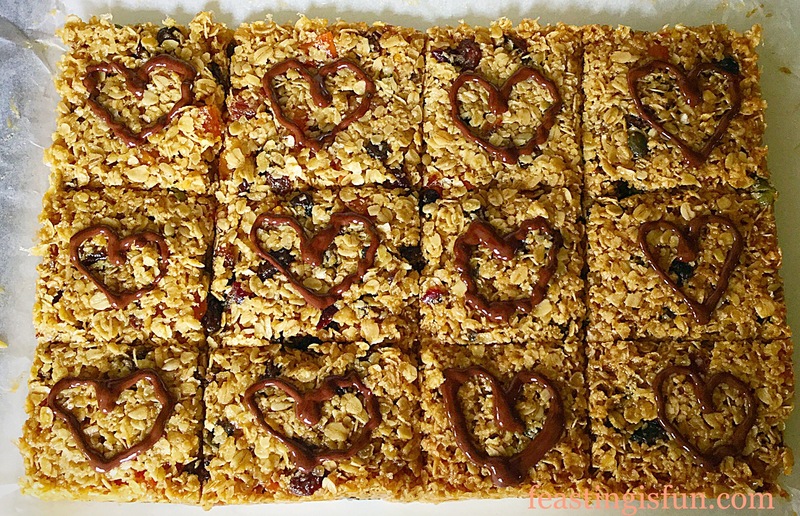 Muesli Flapjack Squares delicious and full of good things for your body. Most people I know don’t have hours of time to spare in the mornings, during the week. They know breakfast is THE most important meal of the day, so in a bid to give their body something they grab a latte and coffee shop choccie muffin on the way to work. Then wonder why they are starving again by 10am if not sooner. 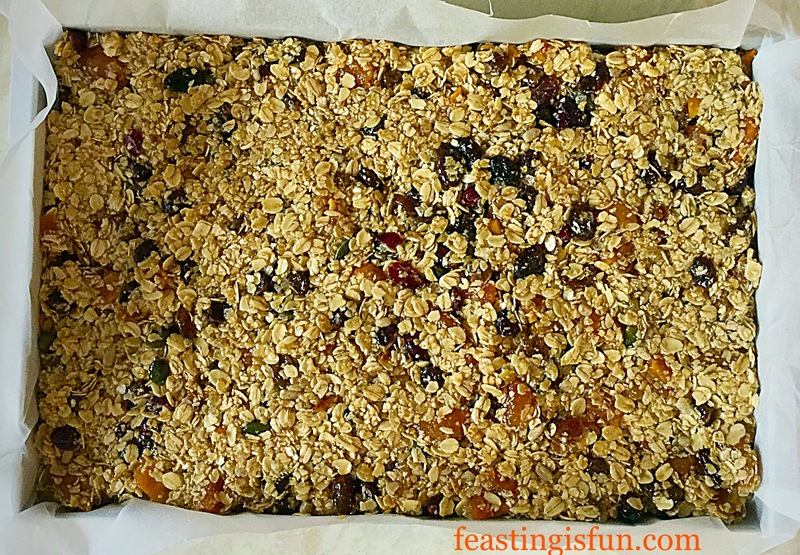 Muesli Flapjack Squares are great food on the go. 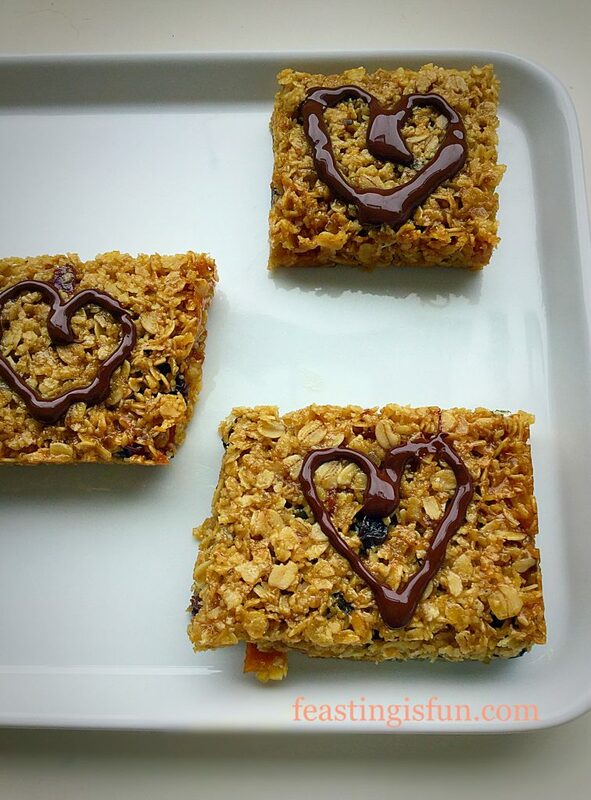 One of these Muesli Flapjack Squares will keep you going until lunchtime! 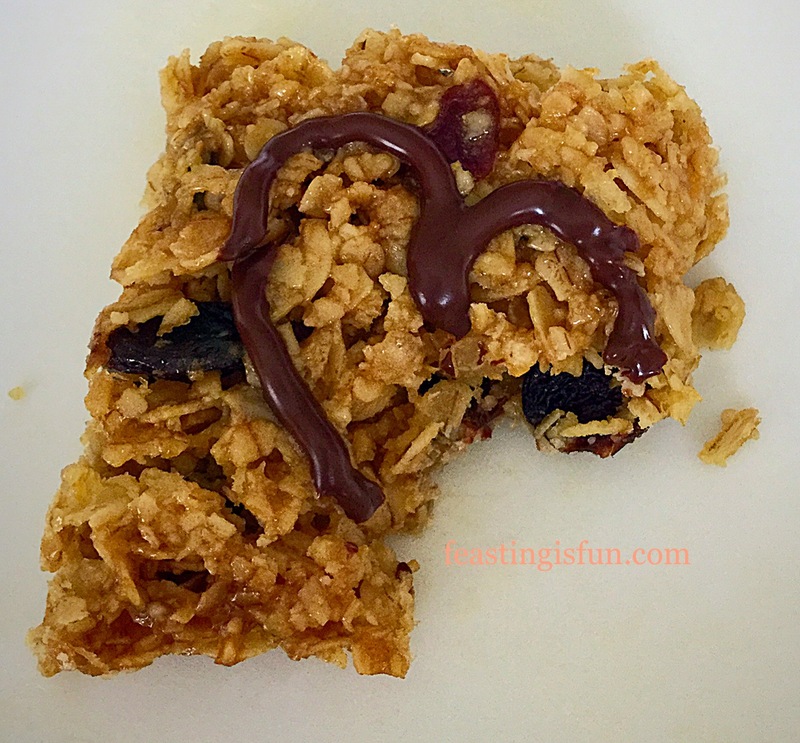 Now eating one of these delicious Muesli Flapjack Squares isn’t the same as sitting down with a bowl of muesli, or a plate of wholemeal toast and homemade jam and a cup of coffee. But, they are a whole lot better both for your body and you wallet, than the take out option. 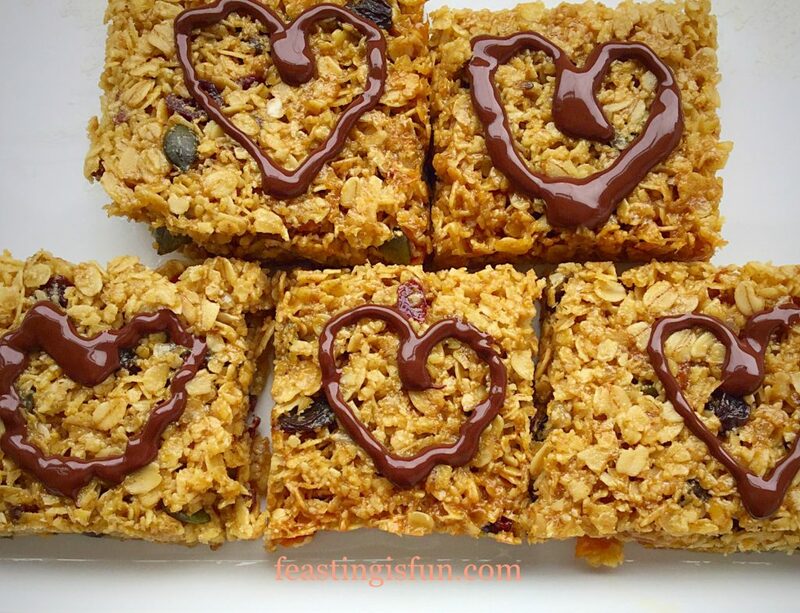 Muesli Flapjack Squares so easy to make. Flapjacks do contain both sugar and butter, as do the take out muffins. I have tried to reduce both and even tried to switch to honey, but, unfortunately I haven’t cracked that recipe code yet. What I have done is taken a fabulous gluten free, muesli mix made by Delicious Alchemy and turned it into the gluten free Muesli Flapjack Squares. 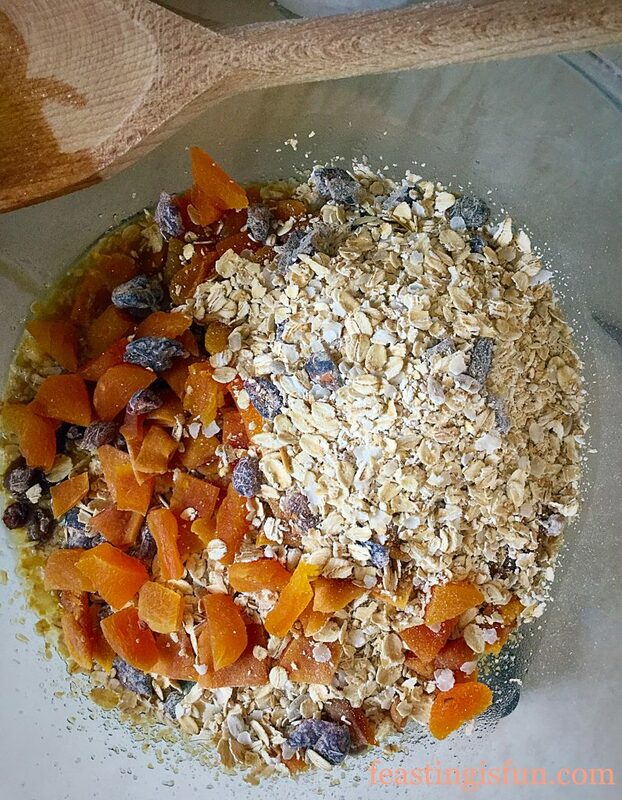 So yes you’ll get the initial sugar hit and a wee bit of caffeine from the dark chocolate, but instead of the post sugar slump, the oats, seeds and dried fruit will start slowly releasing their energy – sustaining you until lunch. My lunch today was one of these and a banana! 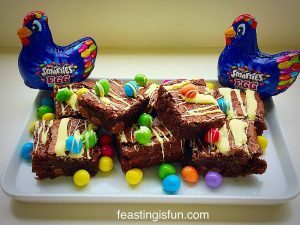 With everything made in one bowl, a little mixing, 20 minutes in the oven, cool then swirl on some chocolate, these can easily made by anyone. If buying a different muesli from the one suggested ensure that it has no added sugar, salt or fat and of course, that it’s gluten free if you have dietary intolerances. 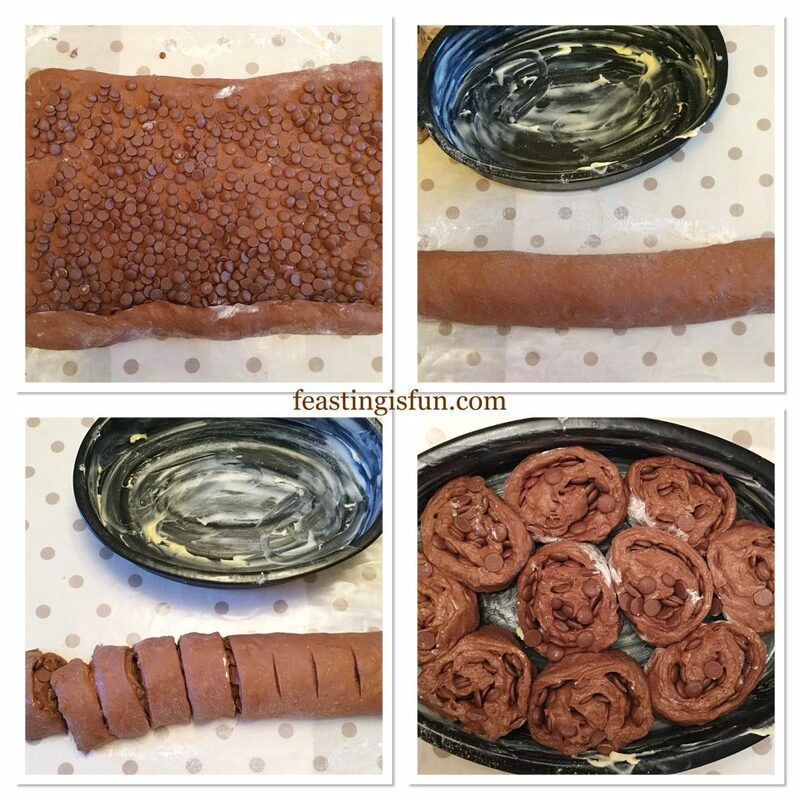 Line a 8″ x 11″ 20cm x 28cm Swiss roll, or 2″ deep baking tin with baking parchment. I have found it unnecessary to grease my tin prior to lining, however, using a little butter in the corners, should help the parchment to stick without fully greasing the tin. In a large heatproof and microwaveable bowl add the butter and then sugar. Place in the microwave a heat on low until the butter is just melted. Once melted remove from the microwave and add the golden syrup. Stir with a wooden spoon until everything is well mixed. Add the muesli and chopped, dried fruit. Next stir everything together until it is all covered in the glossy butter mixture. Tip the mixture into the prepared pan and press flat and even using the back of a dessert spoon. Pressed evenly into the tin, ready for the oven. Place in the centre of the oven and bake for exactly 20 minutes. Once the baking time is up remove from the oven and allow to cool completely in the tin. 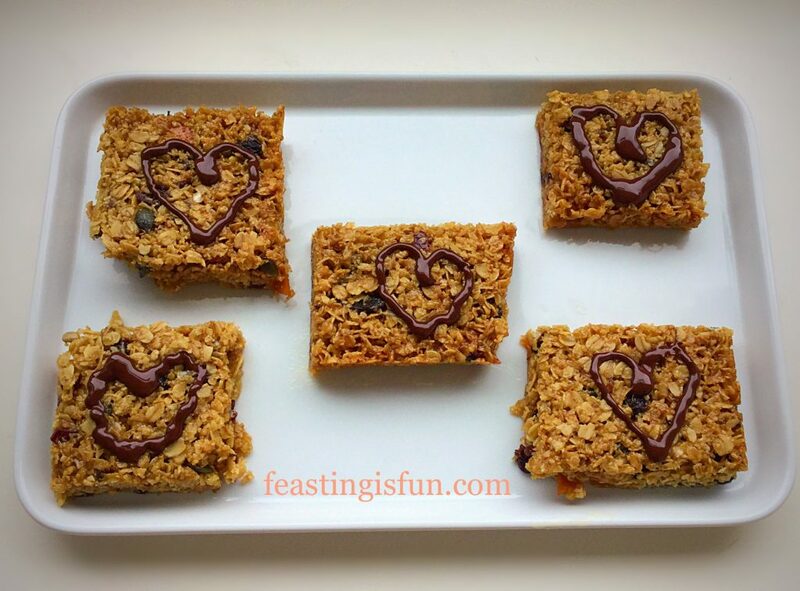 Muesli Flapjack Squares beautifully baked and golden. When cooled lift the flapjack slab from the tin on to a board. Cut into 12 even squares (if you look mine aren’t that even – oops)! Melt the dark chocolate in a heatproof, microwaveable bowl until almost melted. Remove and stir until completely melted. 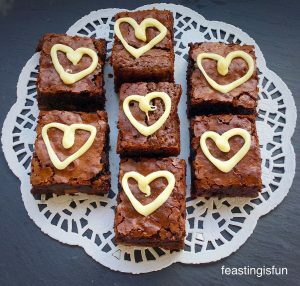 Drizzle over the squares, or fill a small piping bag and pipe hearts on each square. Beautifully decorated with a heart. 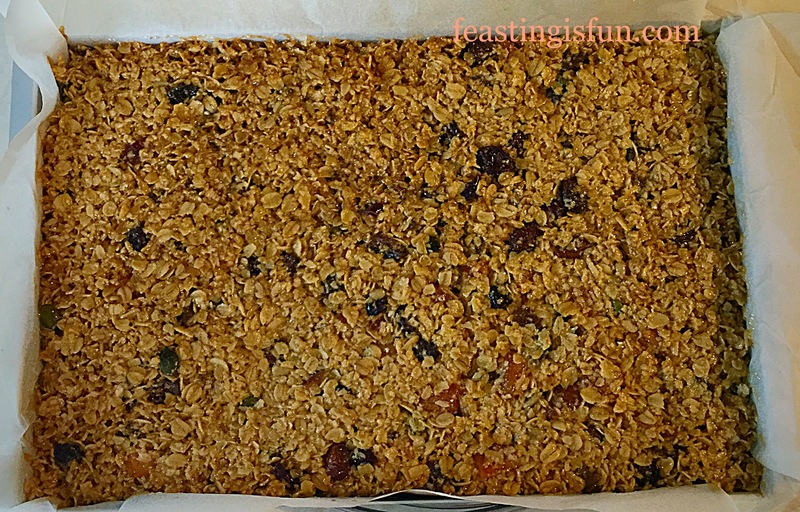 During hot weather it might be worth popping the Muesli Flapjack Squares into the fridge for an hour. This will set the chocolate and really firm up the bars. 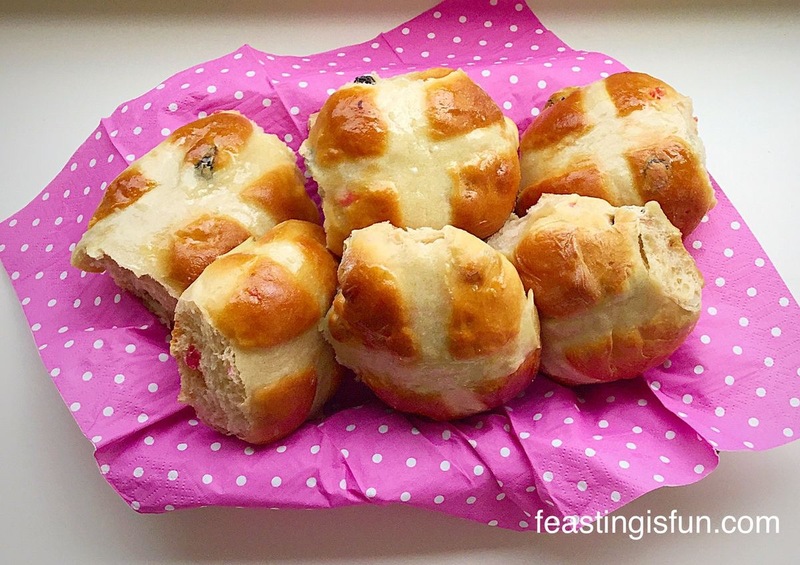 I like to wrap them in baking parchment for packed lunches, cling film and foil work well too. Store them in an airtight container. 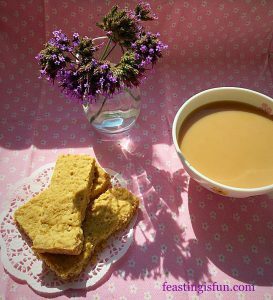 I use an old biscuit tin and separate layers with baking parchment. 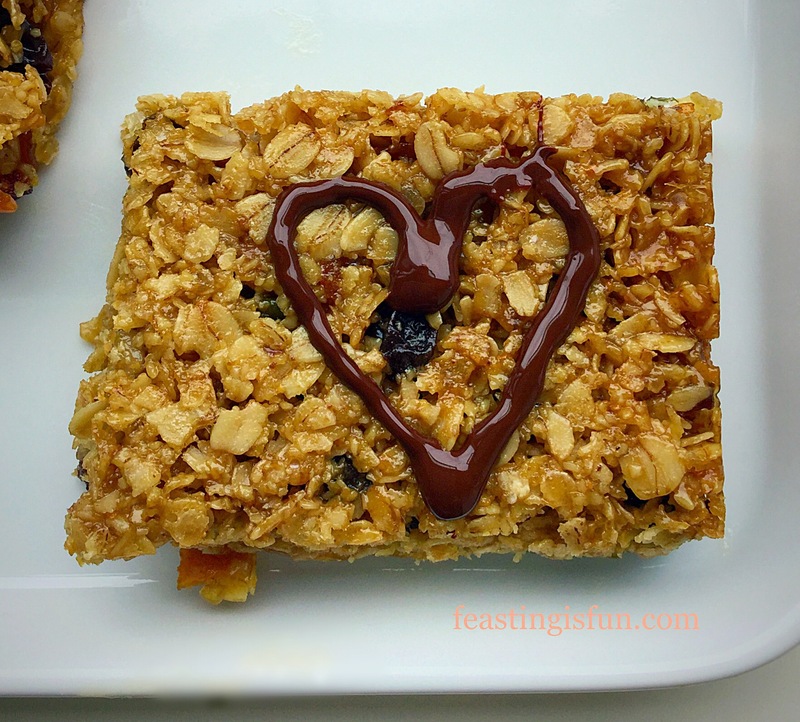 Muesli Flapjack Squares a great solution to breakfast. Give yourself a pat on the back knowing you have breakfast sorted for the week!! 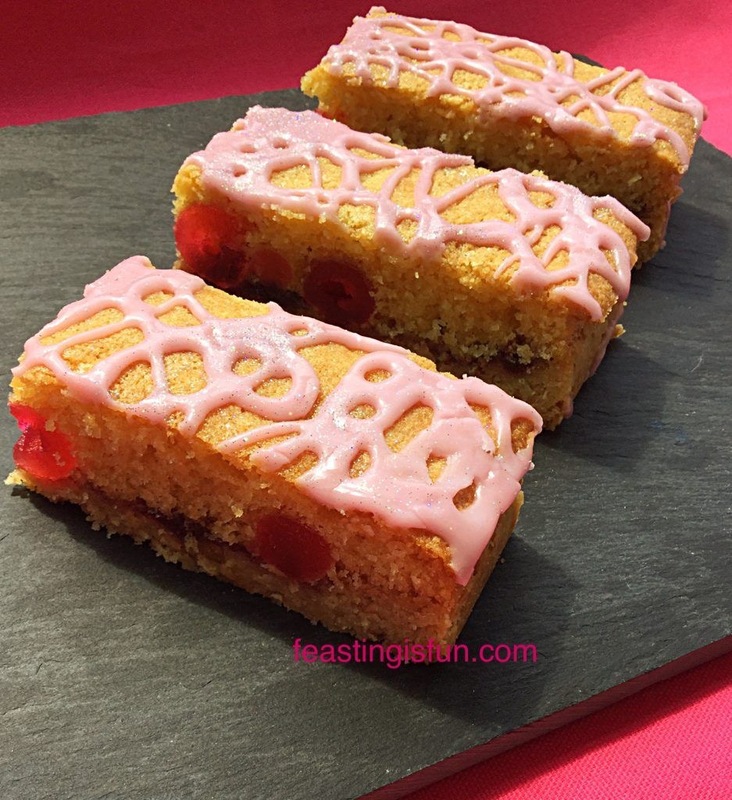 Double Cherry Drizzle Oat Bars a delicious oat biscuit base topped with cherry sponge. Macadamia Apricot Flapjacks another delicious flapjack bar. 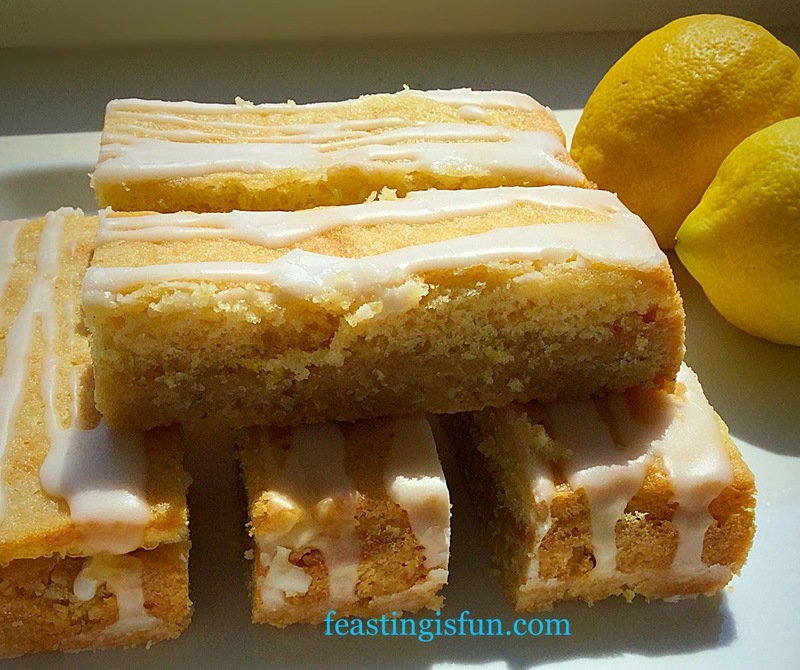 Lemon Drizzle Cake Bars with a layer of lemon curd on top of an oat biscuit base. All of the recipes above are easy to make and are fabulous food on the go. Ideal for packed lunches, picnics, or simply having something on hand at home that easily fits in a tin. 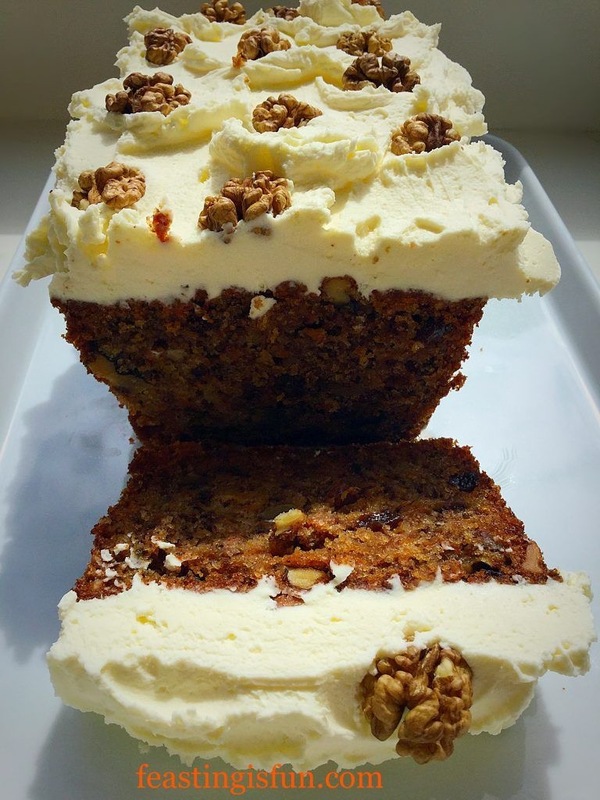 I deliberately left nuts out of this recipe so that more people on a restricted diet can enjoy it. 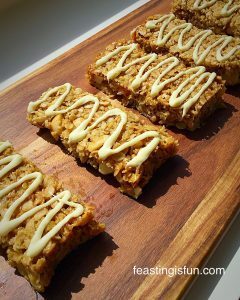 I’ve also successfully switched butter for coconut oil in my Coconut Almond Date Flapjacks, which would make this recipe suitable for those with lactose intolerance. It is my intention to make as many recipes as possible versatile, so that those with dietary restrictions can also have fun feasting! Delicious Alchemy provided the muesli mix for me to try. All opinions, views, content and photographs are my own. Please see my Disclosure Policy.